Organization does not have to be difficult, nor does it have to be expensive. 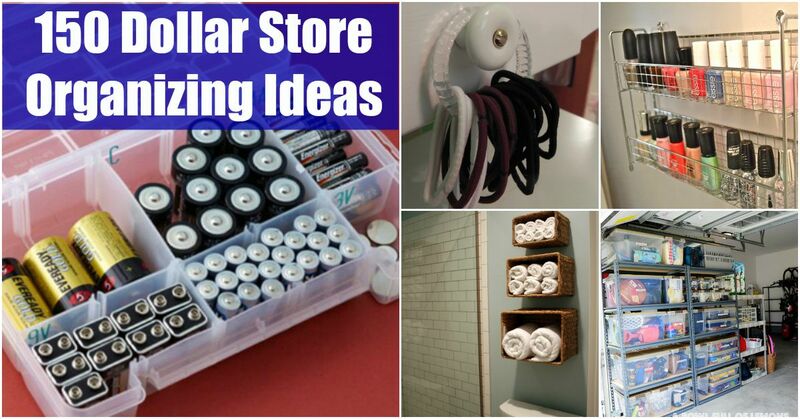 There are so many neat ways that you can repurpose things that you find at your local Dollar Store. From organizing the kitchen and bathroom to taking care of laundry clutter, there are many things that can help you to be more organized. Need to know what to do with all of those scarves? Maybe you have too many toys and just don’t know what to do with them. Whatever you are looking to organize, we have collected a host of helpful tips and ideas and most of the items can be bought for very little money. You just need a little imagination and creativity and you would be surprised at what you can use to organize your life. These simple little plastic crates can actually be joined together, turned on their sides, and then attached to the wall as a cohesive shelving unit. And since they’re only about $2 each, you really don’t have to lose any sleep over what you’re spending. If you have relatively young children, you may spend a lot of your time rifling through their drawers helping them to find what they want to wear. Instead of piling everything up in drawers, you can add small plastic or canvas containers that will keep their clothes perfectly organized. These come in all sizes and will fit into any dresser drawer. 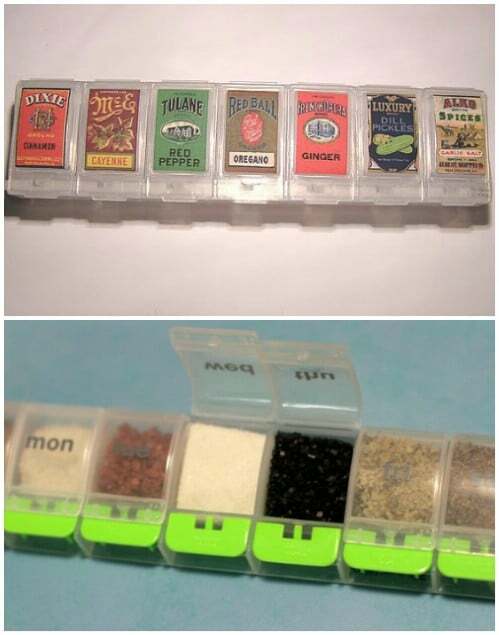 You can make a take-along portable spice kit with a very inexpensive pill carrier. 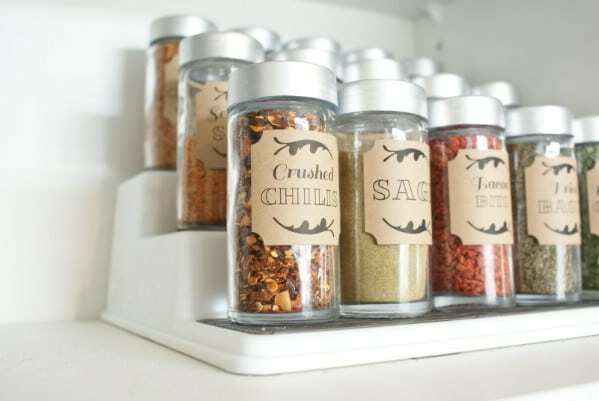 These cost less than $1 at most dollar type stores and you just have to label each section (where the days are labeled) for the spices that you want to carry along. This is a great idea for those who like to add their own spices when eating out. Kids love bath toys. Parents, not so much, especially when those toys drip water all over the floor. An easy way to keep those toys from wetting the floor and getting lost is to pick up a hook with a suction cup that will affix to the bathtub wall. Then you just need a mesh bag and you can hang the toys in the bathtub where they will drip right into the drain. 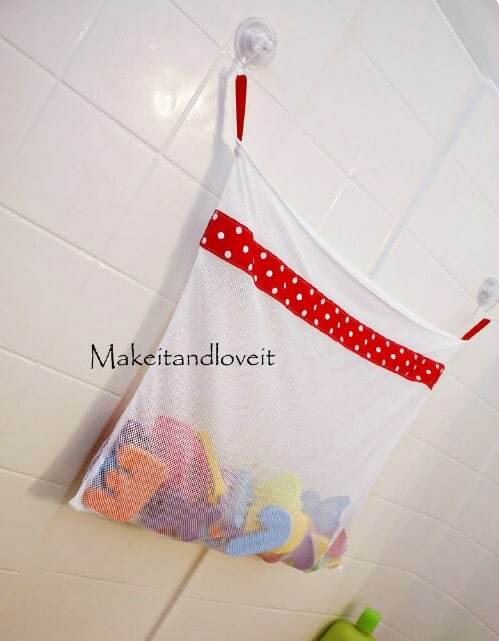 Via: Makeit-loveit – A mesh bath toy bag. Recycled cans are great for organizing paints and other craft supplies. Coffee cans and others are perfect. Once you finish with them, just remove the labels and you can paint and customize them if you want. 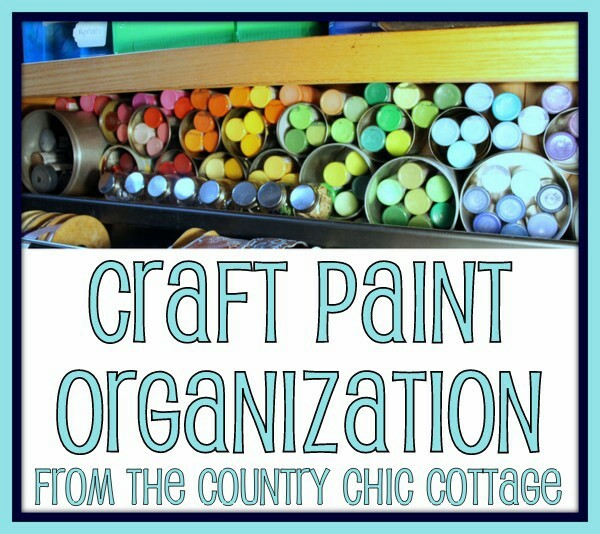 If you don’t have any cans around the house, you can pick up several different sizes for less than $1 each and then create your organized craft center. Craft organizer boxes (or those larger pill organizing boxes) are great for keeping hair supplies and accessories perfectly organized. Looking for a way to keep cords and other electronic accessories organized? Clear plastic cups work great. You just have to label the cups with what you are putting inside and store them all in a small plastic tote or basket. If you have a lot of belts and little room in the closet or drawers, you can make a great organizer using just a few clothes pins and a strip of wood. You just have to hot glue the clothes pins to the wood strip and then use them to hold your belts. 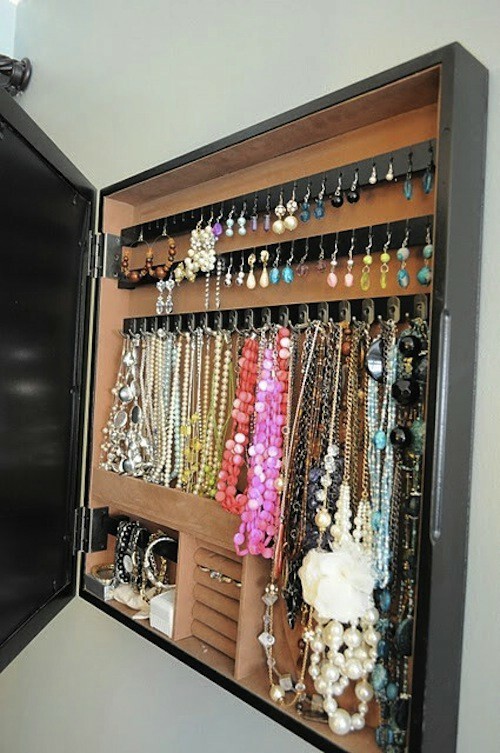 This is also a great idea for jewelry, scarves or other things that you need to hang. Via: Powertoolsandhighheels – Bathroom Update!! Small storage containers, that you can pick up for less than $1 each, are perfect for keeping small items organized. 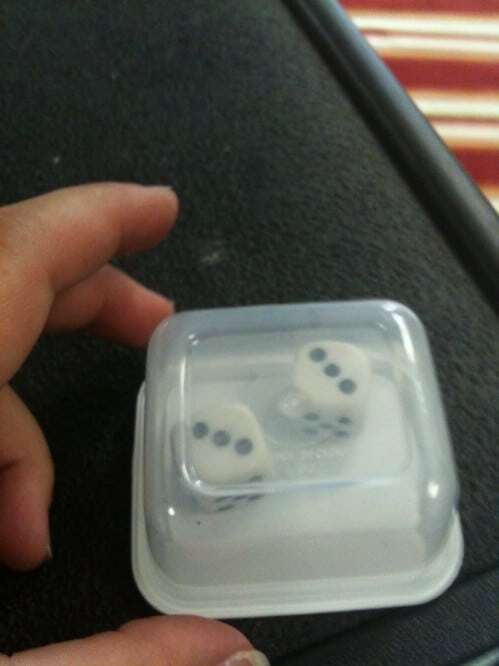 Instead of losing the dice from your board games, why not just keep them all in a handy little container? You can also use these for loose change, bobby pins and other items that often get misplaced easily. 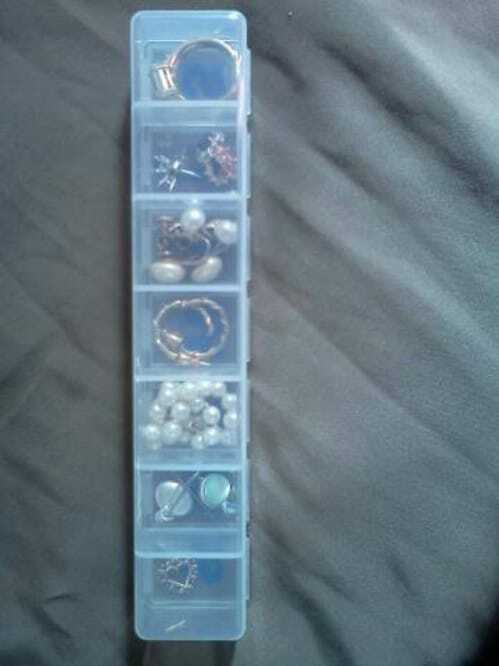 They are great for small nails and screws and because they stack easily, you can keep everything neatly organized. Bobby pins, tweezers and other bathroom items that are relatively small can get misplaced easily. A simple magnetic strip will end this problem. Don’t you just love crafts? Unfortunately, keeping those craft supplies organized can be difficult, particularly when you are dealing with very small items. The solution? You just need to pick up a few small plastic containers with lids and have a picture frame handy (one of those thicker ones). You can label the boxes and then use the frame to keep them all together, neat and organized. 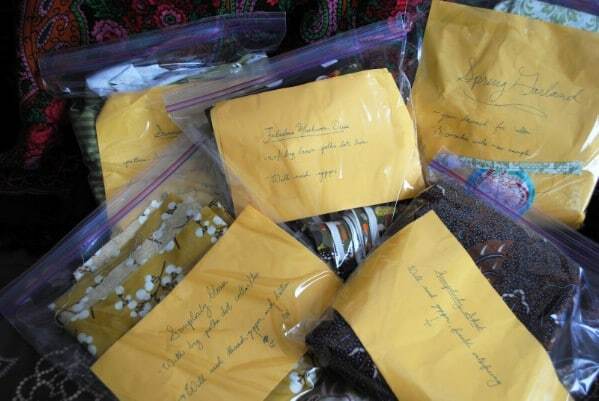 The entire project costs less than $5 and helps you to keep from losing small craft supplies. Who says you have to spend a small fortune organizing your home office? A great solution for smaller office supplies is to use an ice cube tray. You can get these at any Dollar Store for about $1 (for 3 of them). 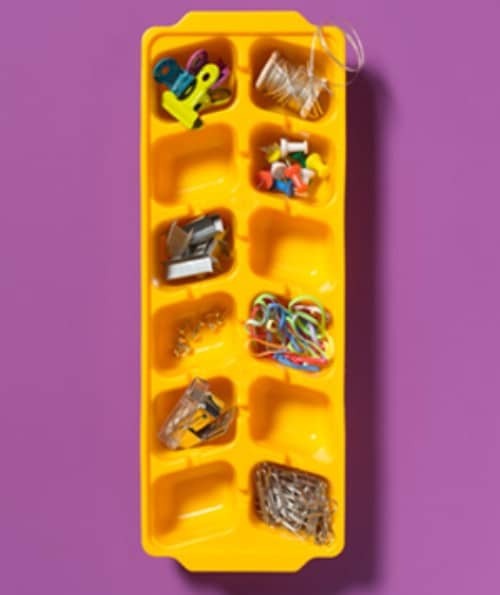 Keep your push pins, paper clips, rubber bands and other supplies in the individual slots and they fit easily into any desk drawer. Once school starts up again parents everywhere will be frantically searching for storage solutions for schoolwork. A great solution for this is a cheap file box. 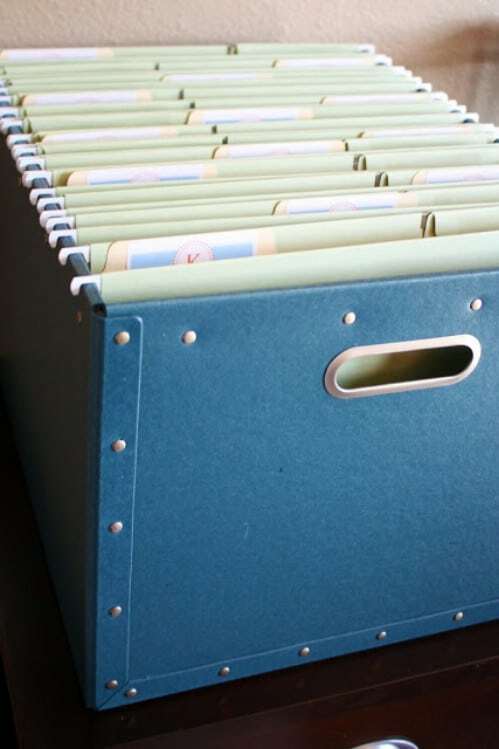 You can keep all of their important papers as well as pictures and other things in a file that is labeled so you always know where to go to get what you need. How many times have you wished you just didn’t have as many toys to pick up? If you are looking for the perfect toy storage solution, consider pop-up hampers. While they are not originally designed for toy storage, they do make a great choice. You can even get the little ones excited about picking up their own toys when you let them “pop open” their own toy hamper. Practically everyone does scrapbooking these days and while it is certainly enjoyable, it also takes a lot of storage to keep those small stickers and pages neatly organized. Spinning racks are perfect for keeping pages neat and protected and you can use a paper towel holder to keep ribbon neatly organized. Baskets are always a great choice for storage and tiny buckets will keep stickers and other embellishments neat and tidy. Hanging shoe organizers are perfect for keeping video games, controllers and other accessories together and organized. You can hang them over the door to your child’s room and he or she will always be able to find what they are looking for. Smaller game systems will also fit into the shoe slots. If you don’t have a need for video game type storage, you can still use shoe organizers to keep movies, coloring books or even stuffed animals organized. If you have children then there is a good chance that you have tons of clothing that your children have outgrown. If you have more than one child you may be waiting to see if some of that clothing will fit the next in line. Instead of getting rid of those clothes, use comforter storage bags. You would be surprised at how much clothing one storage bag will hold and you can organize them by size, gender or type of clothing. The bags fit nicely under beds and in other small spaces. If you don’t already have a menu board, you need one. There really is no better way to keep family events and other things organized. A simple wooden picture frame and a few clothespins will do the trick nicely. Use the clothespins to keep things noted where you will remember what you have going on each week and you can add small cardboard boxes for recipes and other items. When you are short on space, hanging baskets are a great solution. You just need to purchase a few inexpensive wicker type baskets and install them on your wall. Not only is this an easy project, it’s a very cheap one and gives you a place to store things like towels and washcloths, toiletries and anything else that you need extra room for. It simply cannot be stressed enough that totes and baskets are the perfect storage solution items. You can keep all of your bathroom, kitchen and bedroom belongings perfectly organized when you keep them in matching baskets or totes. Did we say that baskets are great for keeping things organized? Well, they are and you can pick up some great plastic ones for organizing the laundry room or cleaning closet. 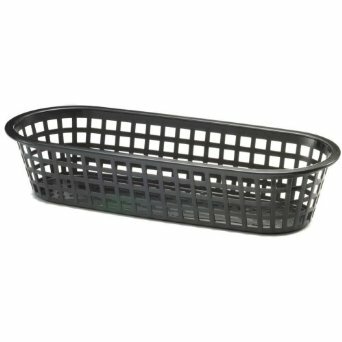 They sell plastic baskets in all sizes and shapes so you can find exactly what works for your laundry room. Just add them to a metal rack or shelving unit and you have perfect organization for under $10 in most cases. If you have a Dollar Tree in your area, you can pick up some great plastic bins to keep your home office organized. These are also great for kids’ rooms to organize toys or you can use them wherever you need a bit of extra storage space. They come in all different colors so you can match them perfectly to whatever room you are using them in and they are really inexpensive so you can afford to organize every room in your home. 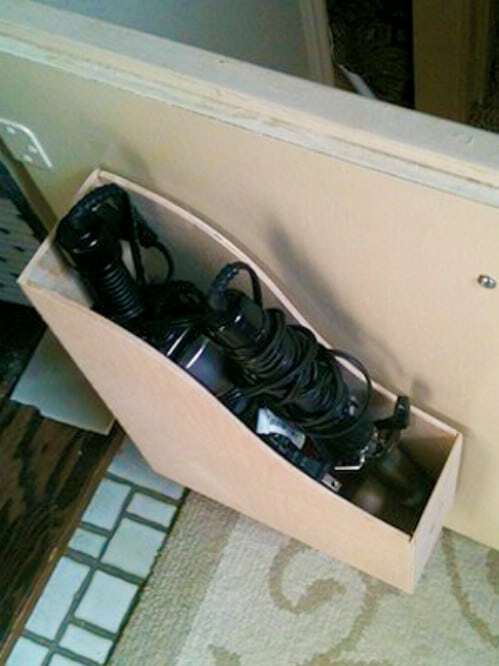 Need a great way to keep power strips hidden and protected? If you have a surge protector or power strip near your desk, you can pick up a metal basket for around $1 or so and use that to keep that strip off the floor where it is hidden from view. Just mount the basket to the bottom of your desk and place the power strip inside. This is a great way to keep cords from becoming tangled and makes your office look a bit neater. Cleaning up under your kitchen sink can be as easy as heading to the Dollar Store to pick up a few supplies. 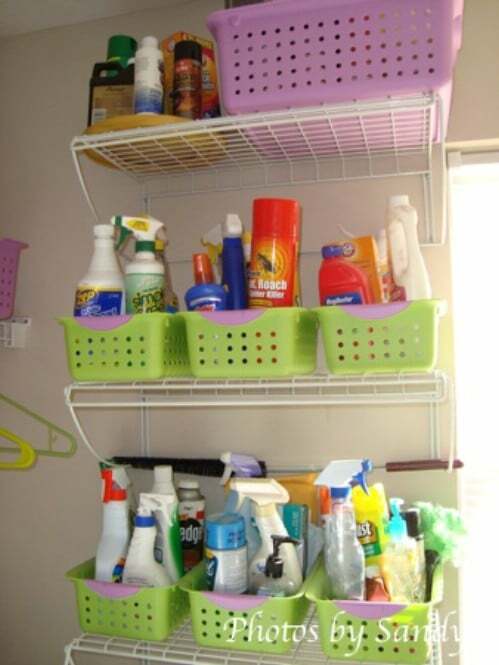 A curtain rod, spray bottles and some plastic baskets or silicon totes make the perfect organization supplies. You can keep your homemade cleaners in the bottles and hang them by the handles across the curtain rod. The baskets will hold your other supplies so that everything is neat and tidy and you can completely organize the sink for less than $20. 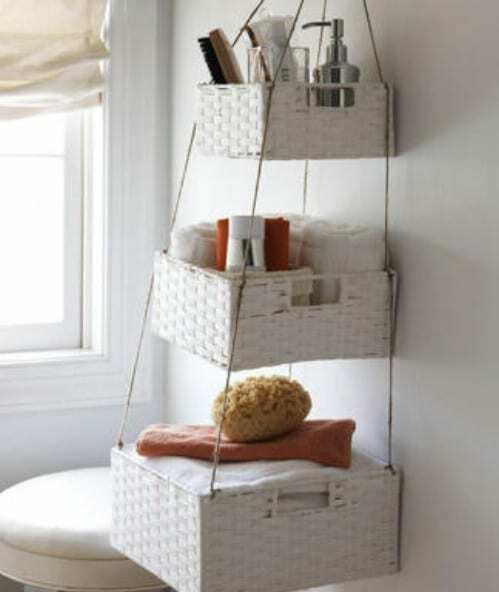 A set of graduated wicker baskets and a bit of rope is all you need to have a better organized bathroom. You can pick up the rope and baskets for less than $10 and then just hang them from top to bottom, smallest to largest. Keep bathroom supplies or anything that you need in the baskets so you get extra storage space and you get it for a really cheap price. 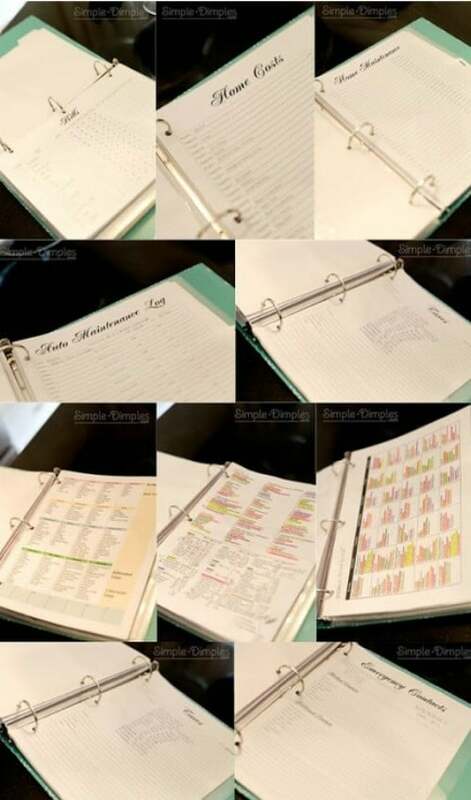 A few very inexpensive binders will help you to keep everything neatly organized. You can use binders for coupons, bills, doctor’s visits, shot records and anything else organized. Just choose how you want to keep things together and then label your binders accordingly. 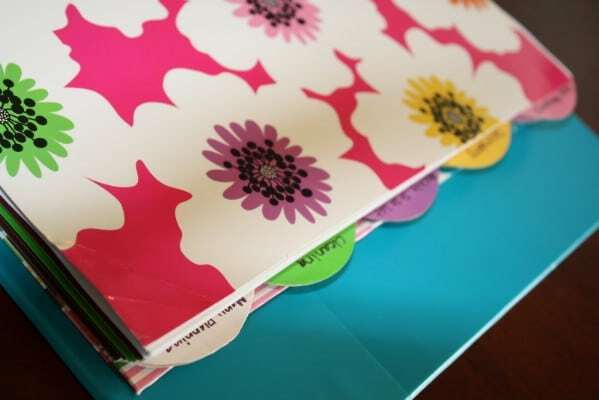 A hanging file folder is also great for keeping your favorite recipe print-offs neat and within easy reach. If you need better organization for your makeup drawer, a few wire mesh containers and some Velcro will do the trick nicely. You can buy the containers for around $1 or so for a larger one and get several smaller ones for the same price. 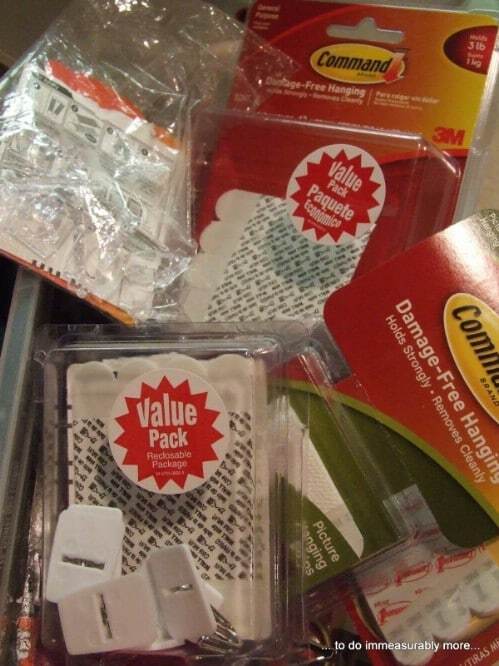 Just attach Velcro to the bottom of the containers and then to your drawer. The containers will keep makeup organized and the Velcro will ensure that they stay that way. Via: Tatertotsandjello – Drawer organization in 15 minutes that won’t slide around!! 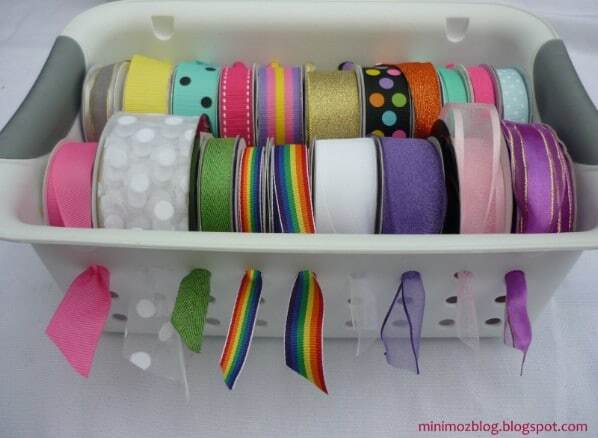 Organizing craft ribbon is not difficult, provided you know what you need. A great way to keep those ribbons organized (and by the way this works perfectly for Christmas wrapping ribbon as well) is to get a small plastic basket – the kind with holes in it. Just insert a wooden or plastic dowel rod that fits from one end to the other. Now, put your ribbon spools on the rod and poke the end of the ribbon through the holes in the basket. If you need a great way to store baby supplies, toys or just about anything else, and you want it to look decorative, you can just add some ribbon to a plastic basket. You can find plastic baskets in all shapes and sizes. The ones with holes in the side are perfect for decorating. These also make wonderful gift holders for baby showers. 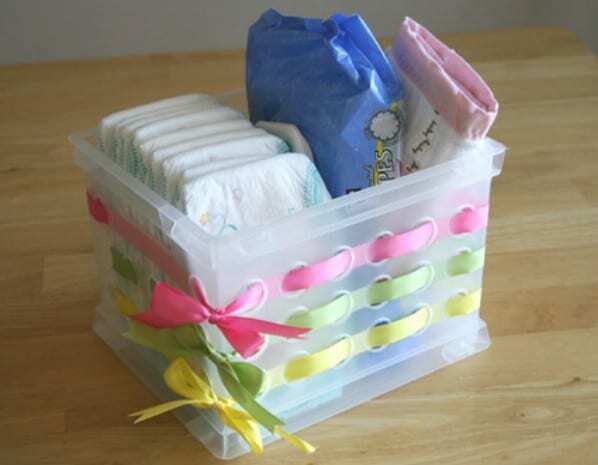 Just add the ribbon to decorate the basket and then fill it up with needed baby supplies. 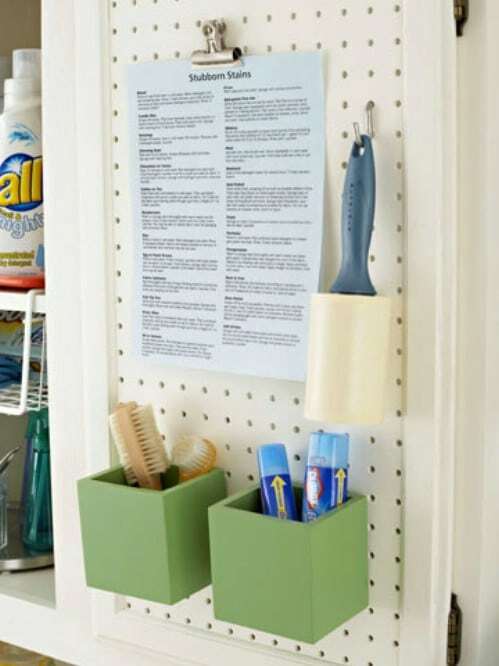 Command hooks are the perfect accessories for organizing the clutter under your kitchen sink. 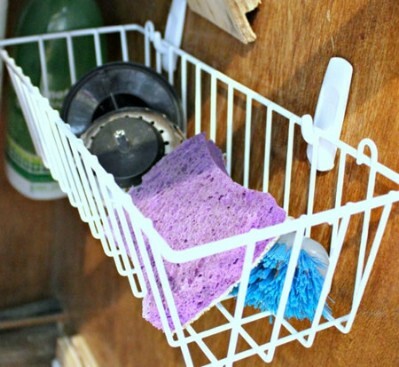 You can use the hooks to hang up plastic bottles or affix metal shelves to the inside of the cabinet for holding sponges and other cleaning supplies. 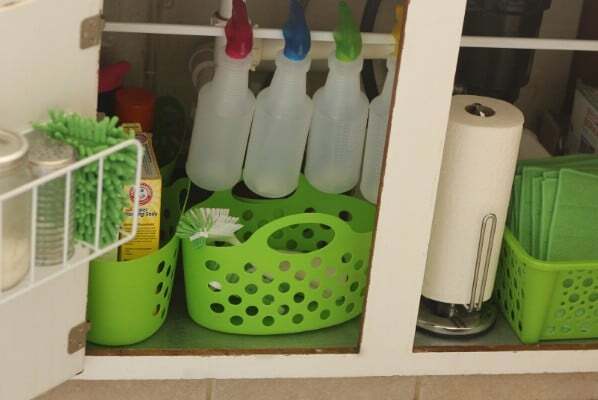 Add a few baskets or even a paper towel holder inside the cabinet door and your cleaning supplies will always be tidy. For an effective, and cheap, way of keeping sponges and dish towels dry, consider hanging a tension rod under the sink. You can also use hooks to hang your towels or hang a small basket from hooks to keep sponges organized and give them room to dry. 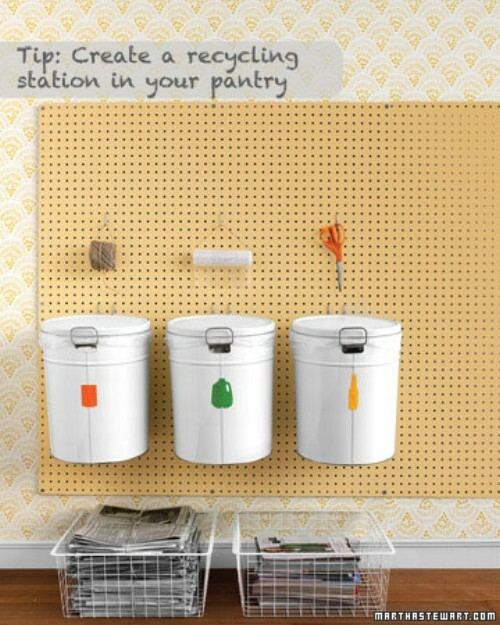 Tension rods and Command hooks are really inexpensive and go a long way in helping you to keep your kitchen organized. 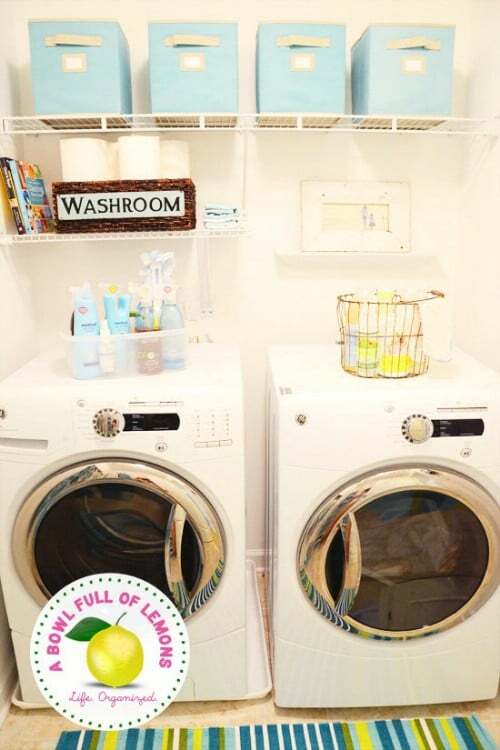 Making over your laundry room, and getting it organized, takes just a little time and very little money. 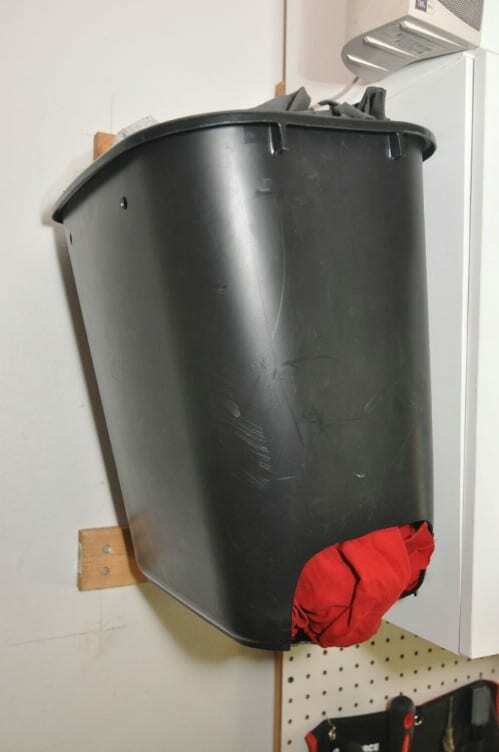 If you hang laundry baskets on the wall and label them, you will be able to keep your loads sorted which will save space and time when it comes to washing clothes. You could also purchase one of those hampers that is divided into three sections and label it so that you get additional sorting and storage. 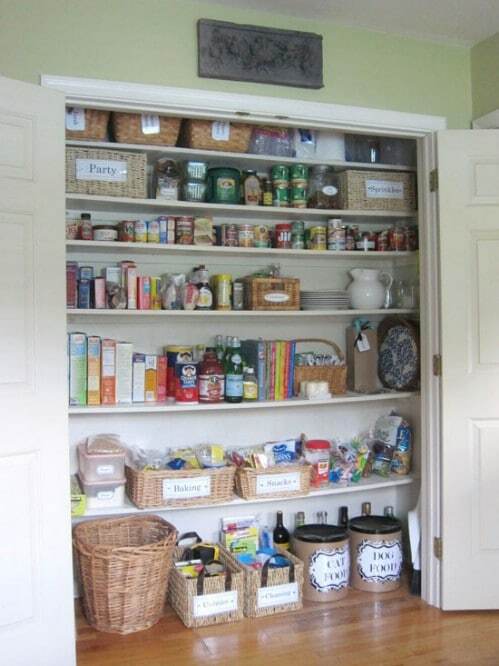 You can easily turn an ordinary coat closet into a kitchen pantry and keep it organized with just a few baskets, plastic totes and other items that are very inexpensive. When it comes to complete organization, labeling is key. You can print out many labels for free or if you have a label gun, make it your best friend. 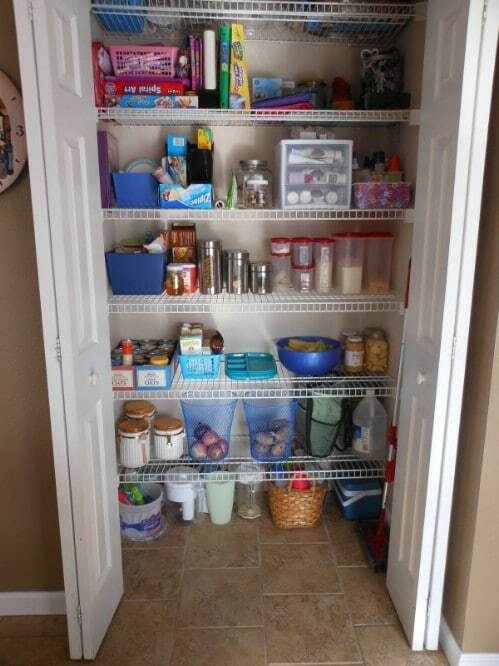 Keep similar foods together in plastic totes or baskets and your pantry will always be organized. Simple and cheap cardboard boxes are great for organizing just about anything. 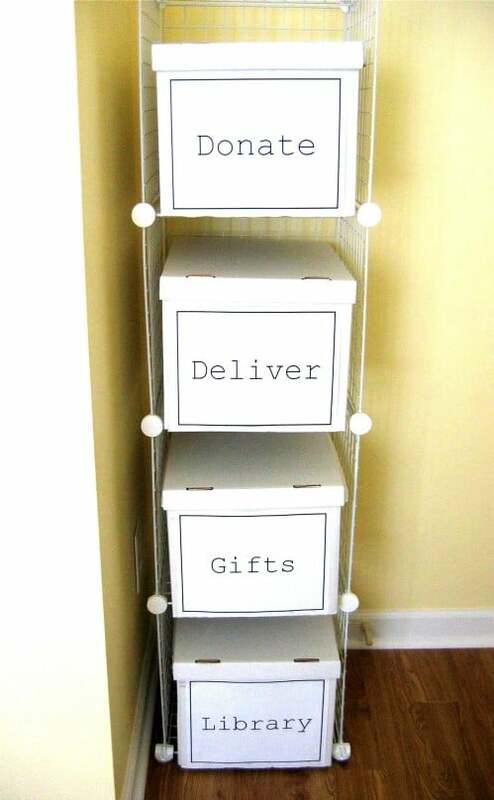 You can start with wire storage cubes and then just add the plain white boxes, with labels, for things that you need to keep tidy. Have a box for clothes that you want to donate or you could even use this system for your recyclables. 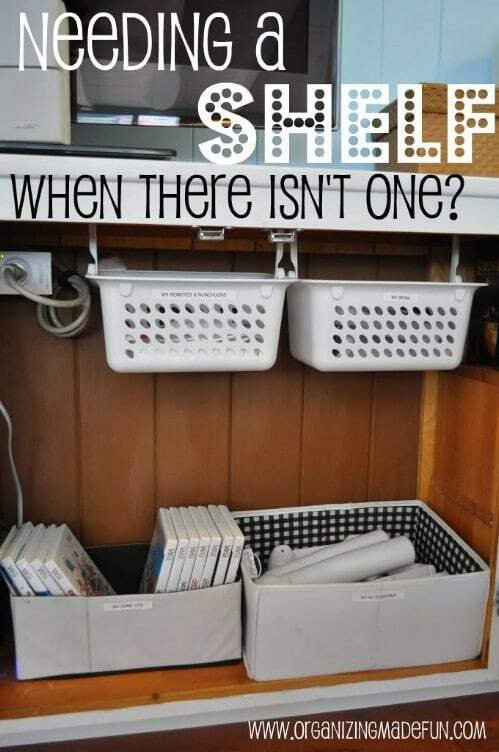 This is a great way to keep things organized without needing a lot of space or money. Wall space is something that very few people think about utilizing when it comes to organization. With a cheap wall grid, you could be keeping pictures, school papers, recipes and other items within easy reach and perfectly tidy. You could even use a small grid to set up a command center. 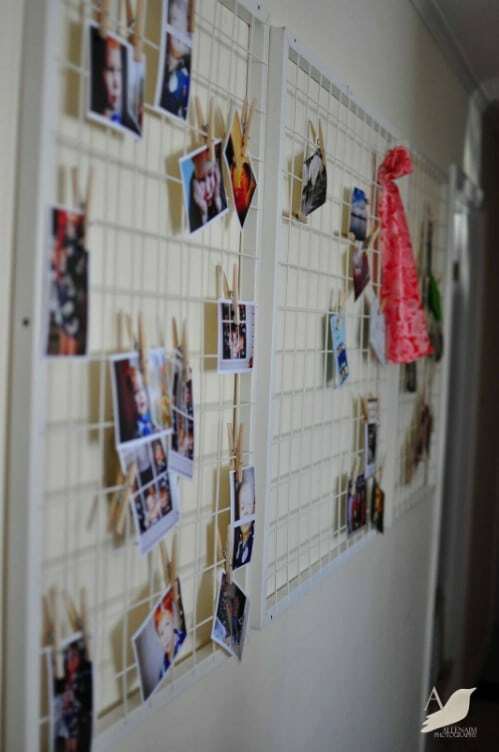 Just attach the grid to the wall and use clothespins to keep items in place. Add a calendar, memos and even small envelopes for coupons and other items. Whether it’s summer or winter, keeping winter gear organized is essential. 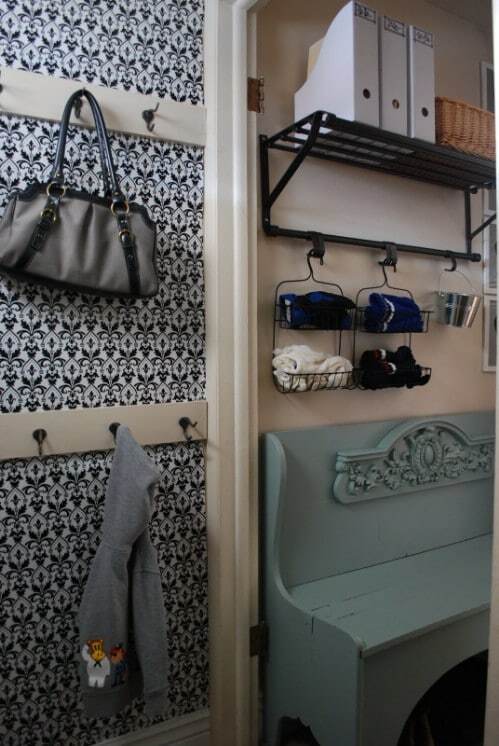 A cheap shoe organizer is great for hanging in the mud room or on the back of the door. You can label the sections for each of your children and allow them to put their hats, mittens and anything that they use when playing outside in the sections. This way, they will always know where their winter gear is and you won’t have to pick them up from the floor after a day of playing in the snow. Plastic Ziploc bags are great for storing just about anything. You can get them in so many sizes and you can use them in the kitchen, bathroom, bedroom or anywhere that you need to keep certain items together. Just put labels on the bags so that you know what is in them and stuff them full of whatever you need to store. Larger bags are great for keeping Christmas ornaments and other items safe and tidy. If you knit or crochet, you may need a great solution for keeping your yarn organized. You can find mesh hampers in many different sizes and some of them have different compartments. These are great for keeping your knitting or crocheting supplies neat. You can keep needles in one section, yarn in one and even put knitting patterns or books in another. They are very versatile and can be stored in the tiniest of places. Organizing your spices doesn’t mean completely redoing the kitchen cabinets. There are cheap and effective ways to keep those spices organized. How about putting them in small mason jars with labels? You can pick up mason jars pretty cheap, particularly if you shop at Dollar Stores or yard sales. Then just label them appropriately and they will stack on top of each other very neatly. Dollar Store containers are cheap and very useful. 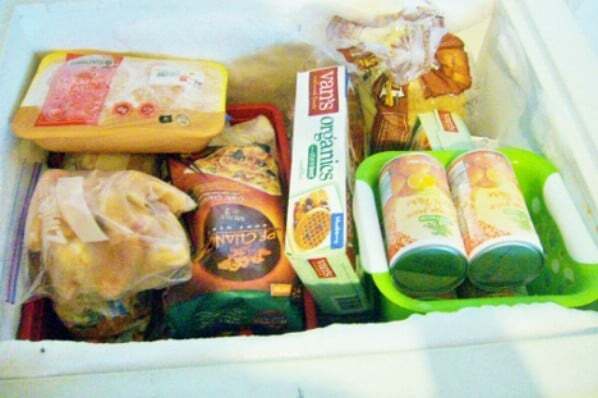 If you are looking for a way to organize your freezer, those little plastic baskets are a great idea. You can pick them up for less than $1 each in most cases and use them to keep like foods together. Have a basket for veggies, one for fruits, breads and meats or whatever you need. You could also organize complete meals into each basket so you know what you’re cooking for every night of the week. If you are planning to travel and you need to keep jewelry organized, a pill container is great. These things cost about $1 and will give you up to 7 different slots for jewelry. Just keep the jewelry that you are planning to wear together in each slot or use different slots for different types of jewelry. The compartments are large enough to hold earrings, bracelets and necklaces and keep them all neat and tidy. Most women have a love/hate relationship with the laundry room, mostly because it seems to collect clutter more than other rooms in the home. Organization is not difficult and will help you to maximize space and time. Just begin with baskets or totes that are labeled for cleaning supplies and even specific wash loads. Teach everyone how to sort their laundry and place it in the appropriate basket. You can keep baskets on shelves or hang them on the wall if you don’t have a lot of space. An organized arts and crafts closet not only makes you happy, it thrills your kids as well. If you have a closet that you use for these supplies (if not, you can use a simple bookshelf) just begin by picking up a few plastic totes or bowls. Label those for crayons, paint brushes, etc. You can get plastic baskets that work great for this and they come in different sizes so you can have larger ones for coloring books and paper and smaller ones for crayons and other items. Organizing thread is a breeze. 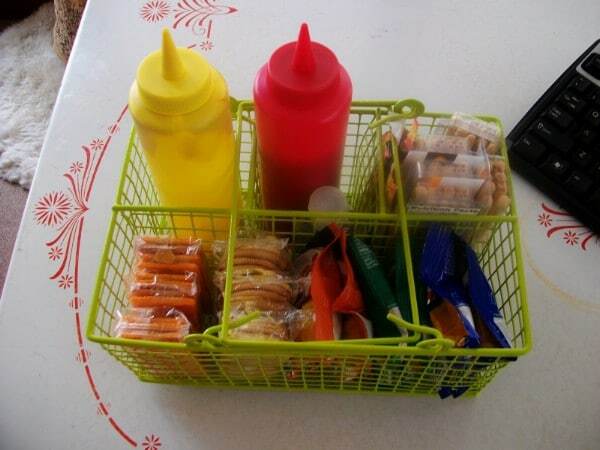 You just need to pick up small, oblong plastic baskets which you can find at the Dollar Store for about $1 for 2 or 3. Organize your threads by color in these baskets, which by the way stack so you can save space as well. 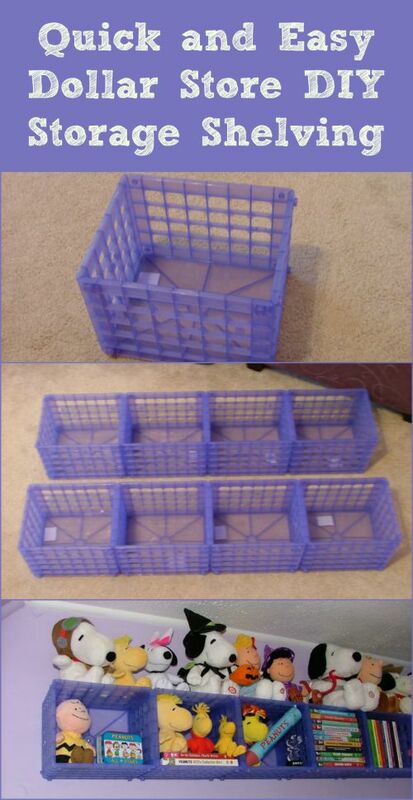 You could also pick up a larger plastic box or square basket and stack all of the smaller baskets inside to really get them organized. There is simply never enough room in the closet for everything that you need to store. The solution is as simple as buying a few plastic milk crates and hanging them up. 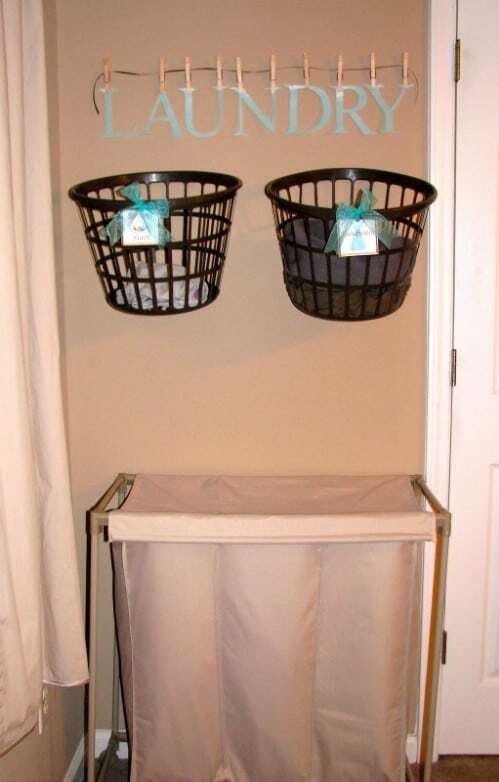 You can use inexpensive hangers, like the Command ones, and the crates have holes so they will hang easily. Just use two hangers per crate. The crates will hang at an angle toward the door so you will be able to see what goes in each one. Small baskets with handles are great for adding shelves when you need them. You can use these under the sink or in your entertainment center. Hang them from cup hooks and you have instant storage and the baskets are really cheap if you get the plastic ones. 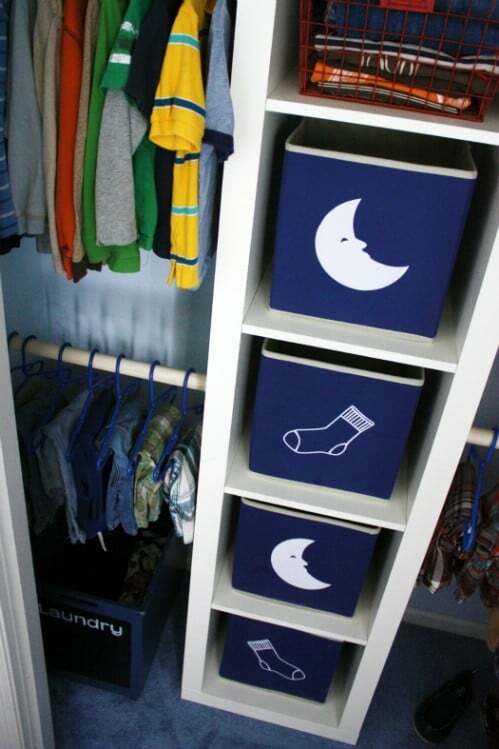 These are great for kids’ rooms for keeping toys and books organized or you can use them for whatever you need. 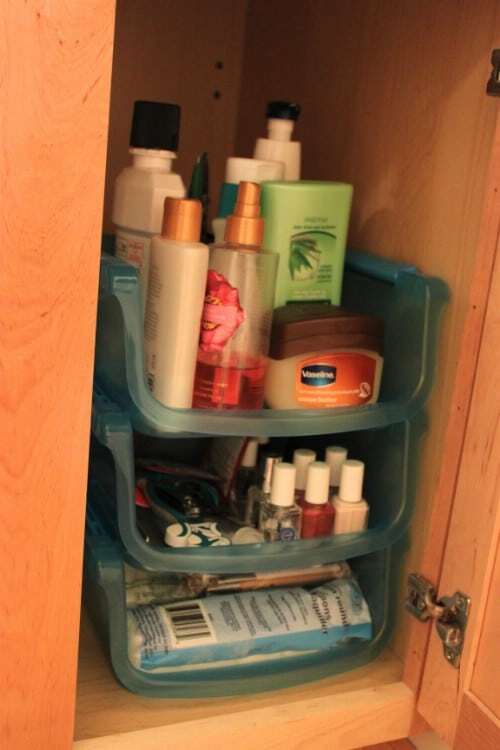 Did you know that you can organize your entire bathroom with just one trip to the Dollar Store, and for less than $20? You just need to decide what needs storing and pick up a few baskets, totes and other items. 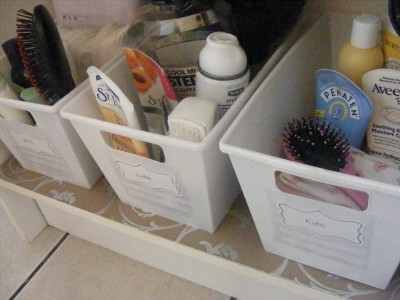 Baskets are great for keeping shaving supplies, shower gels and soaps and other items organized. Hanging shower caddies are perfect for keeping shampoos and things organized and there is no rule that says you can only have one. Hang them on the shower wall with Command hooks. You don’t have to have a huge closet to get the storage space of one. You just need a few totes, baskets and bins and you can perfectly organize any space. Just label the storage containers so that you always know what’s inside. 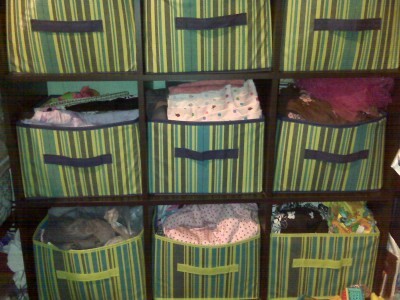 You can have totes for winter clothes to store during summer and plastic crates are great for keeping toys organized. If you coupon, and many of us do these days, keeping your coupons organized can seem impossible. A few inexpensive plastic containers or binders will do the job nicely. Just remember to put coupons that expire soonest toward the front and you can separate coupons by expiration or by the type of product so that you can easily find what you are looking for when it comes time to shop. Heading to the beach? If you are and you want to keep those beach toys from getting lost, or dripping all over your car on the way home, why not pick up a pop-up mesh hamper. These are very lightweight and the mesh will allow toys to air out so that they dry faster. 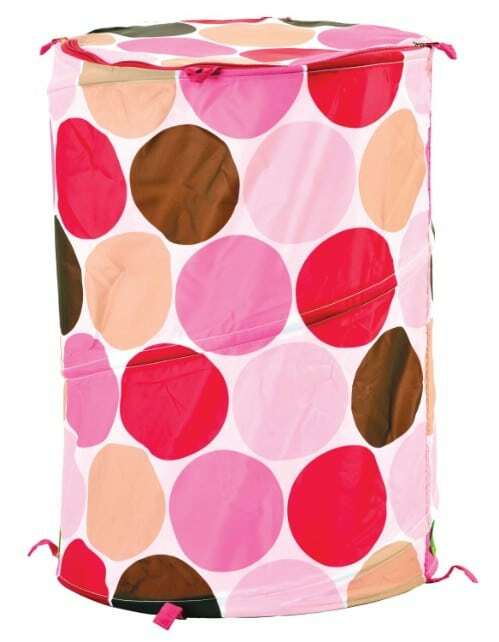 This is a great, and inexpensive, way to store and transport beach toys. 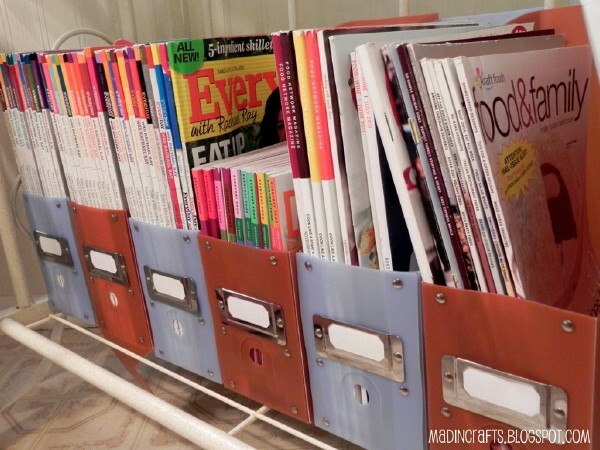 Magazine storage containers are a must for all of those cooking magazines. Unfortunately, the more magazines you have, the more time it takes to find what you are looking for. If you tear out the index page from each magazine and put it in a binder, you will be able to find those recipes a bit faster. Just label the page with the issue date so that you know where it came from and you will be able to find recipes a bit faster. You can perfectly organize your schedule, bills, savings and even your grocery list with a cheap binder and a few dividers. You can get a binder for about $1 and several dividers for the same price. Just label the dividers depending on what you need to organize. You can print off a calendar to keep in the binder so that you have important dates noted and keep your finances and everything else perfectly organized. 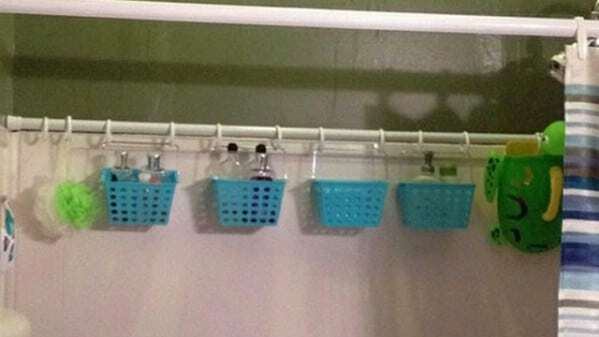 If you have tons of bottles in the shower, you can easily organize them by simply adding another shower rod. 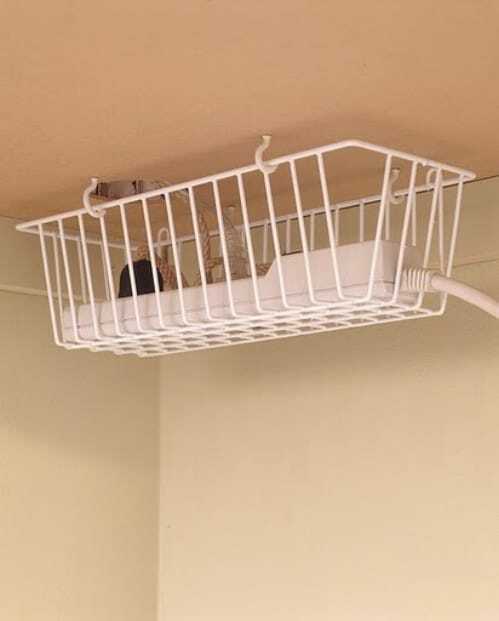 Hang small baskets from the shower rod to keep shampoo and conditioner as well as shaving supplies, bath sponges and soaps off the shower wall. Add a basket for bath toys and other items as well. This is a great idea for drying delicates and bathing suits as well. A binder, or the hooks that come inside the binder, is a great idea for organizing jewelry and makeup inside the bathroom cabinet. Just use screws to attach the hook to the door and use the rings to store items. Small bags that have holes are great for makeup and smaller items and you can even hang sponges, brushes and other things on it. 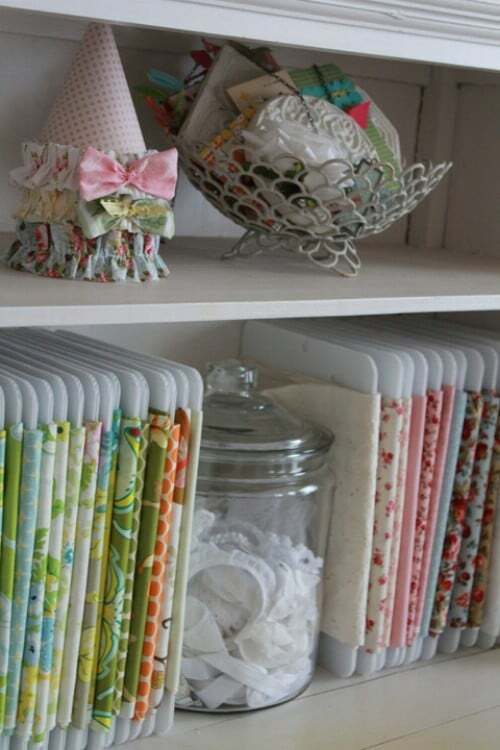 Need to store craft ribbons? A simple metal hanger and a few clothes pins will do the job. Just clip the end of the ribbon on a clothespin and roll it up. Then you just have to clip it to the hanger. 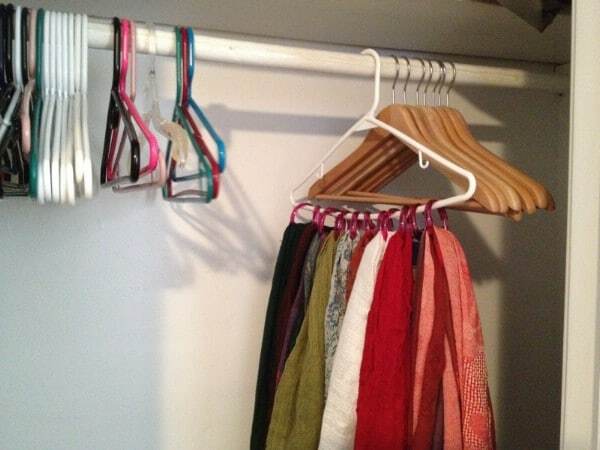 You can get several rolls on a single hanger and hang it wherever you want. Simple cardboard boxes make great drawers if you need additional storage. You can even decorate the drawers by adding fabric or contact paper to make them a bit prettier. Then just add what you need to store and stack them. They will look like a small dresser and give you loads of storing opportunities. If you are looking for a neat idea for displaying kids’ artwork, look no further than the picture frame isle. 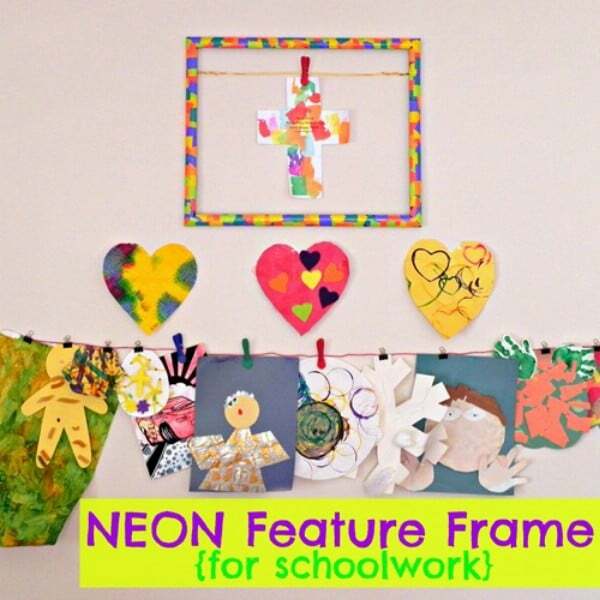 You can decorate a picture frame using colored construction paper and then take out the glass and hang a wire or ribbon across it. Use clothespins to hang the artwork so that it can be displayed until a new piece comes in that needs to be shown. 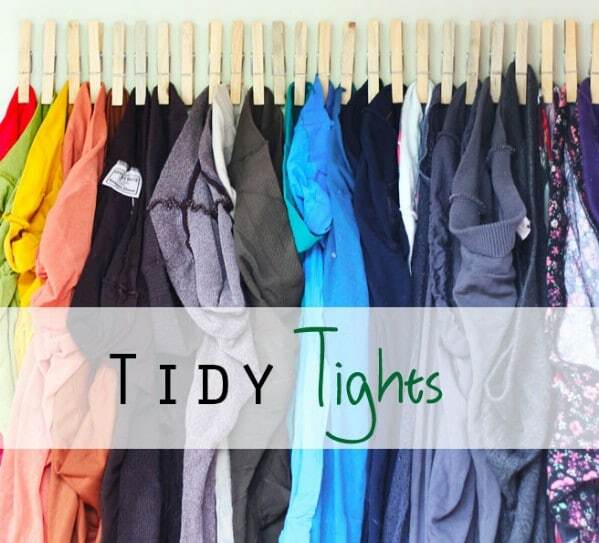 Fall is just around the corner and with it comes a load of tights to be organized. 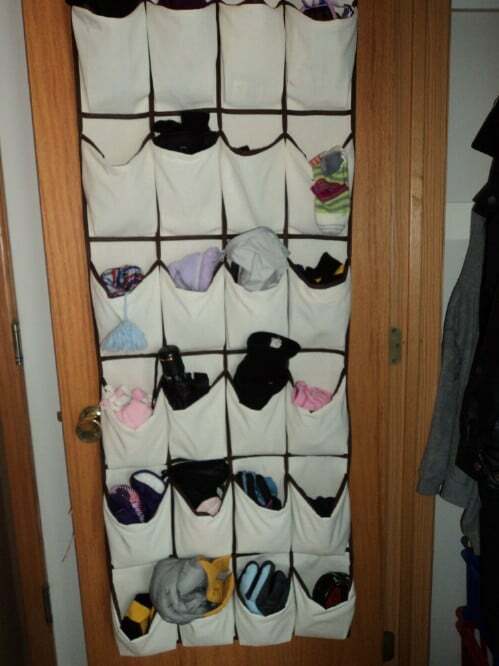 Instead of stuffing those tights in a drawer, hang your own organizer that is easy and cheap to make. You just need wooden clothespins and a hot glue gun. Find a place to hang them, inside the closet or behind the door works well, and hot glue the pins to the wall. Now just use them to hang your tights so they are perfectly organized. A simple rope, chain or ribbon and some wooden clothespins are great for keeping your schedule organized. 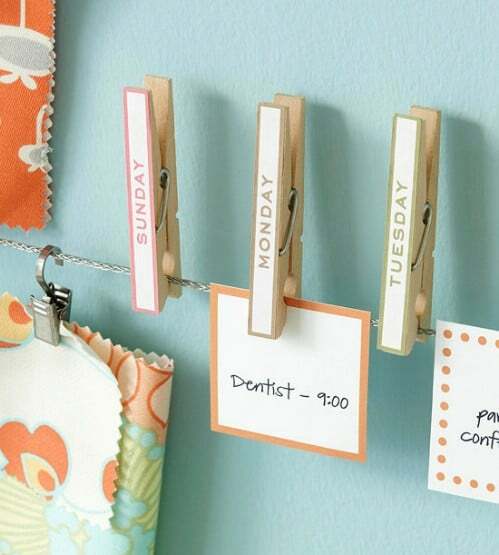 Just use the pins to hang up notes for what you have going on for the day, week or month. As you finish each task, remove the note and move the others forward. This keeps you abreast of what is happening and helps you to keep your time more organized. With an old nightstand, a little paint and some imagination, you can turn your diaper storage into a sci-fi masterpiece. 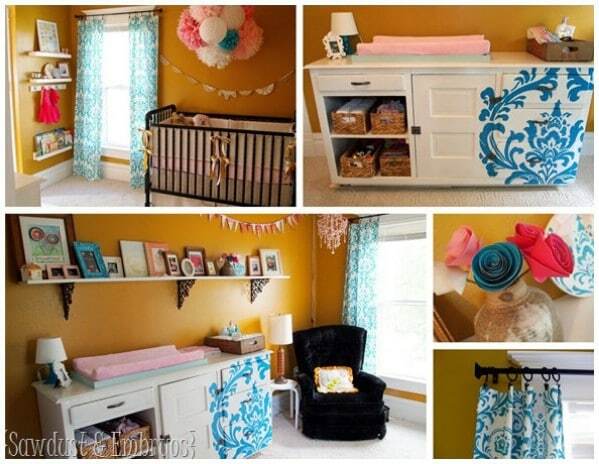 Just add baskets for keeping diapers and other items handy. If you are not really into sci-fi, you can just paint the nightstand however you want it and still give your nursery a great look that costs you very little. 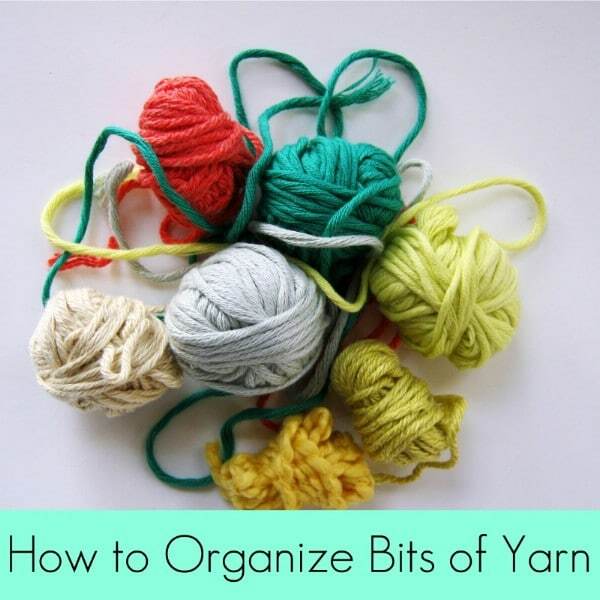 If you have small bits of yarn left over after a crocheting or knitting project, don’t just throw them out. You may actually need these bits in the future. Instead of chucking them, just take a few clothespins and roll them up. You will need to clip the end of the yarn to the clothespin and then roll it. They will store neatly in a small basket so you will have them when you need them. Canvas containers that you can pick up for a steal at most Dollar Stores are great for organizing just about anything you can imagine. If you have little space in the kitchen, you can redo a shelving unit or dresser and use the containers to keep supplies organized. You can also use these in closets or just anywhere that you have open space and want it to be a bit more tidy. If you have a kid going off to college in the fall, you can find loads of organizing supplies that are inexpensive and very useful. 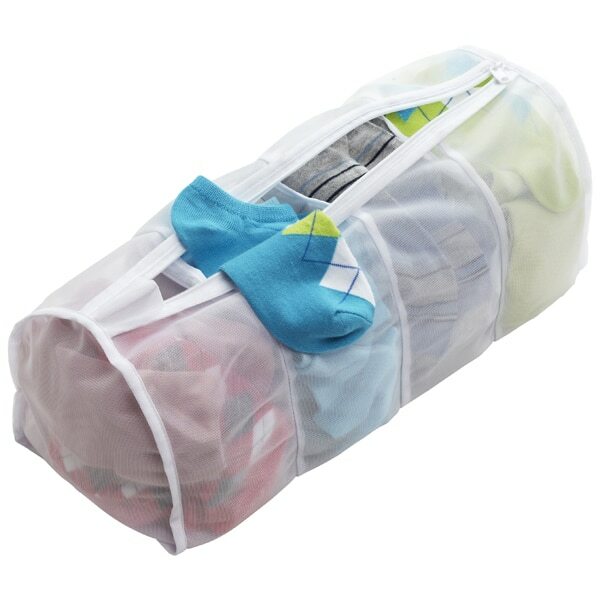 Large Ziploc bags are great for keeping clothes together and baskets, buckets and crates will help your child to keep their things neat and tidy in the dorm room. Plastic bins are great for makeup, jewelry, shoes and other things. 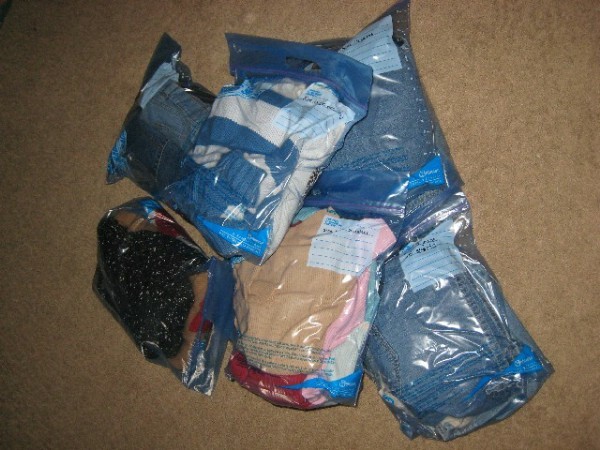 Clear plastic garment bags are great for storing out of season clothing. Some bulkier items may take up too much room in the dresser and if you prefer not to hang sweaters for months on end, you can just fold and lay them flat in a garment bag and then hang the garment bag by the hole at the top. 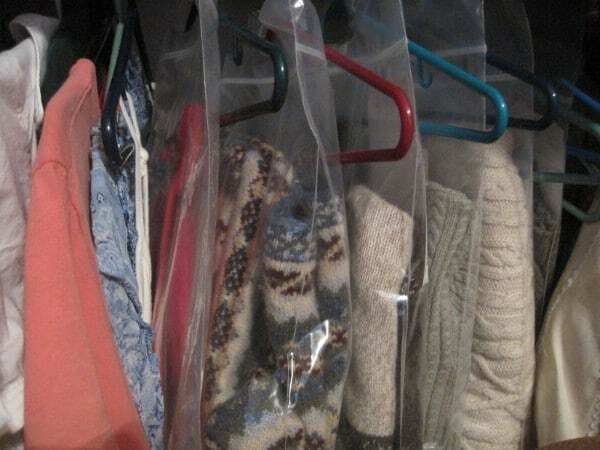 Place all of your fall and winter sweaters in a single bag to save space. 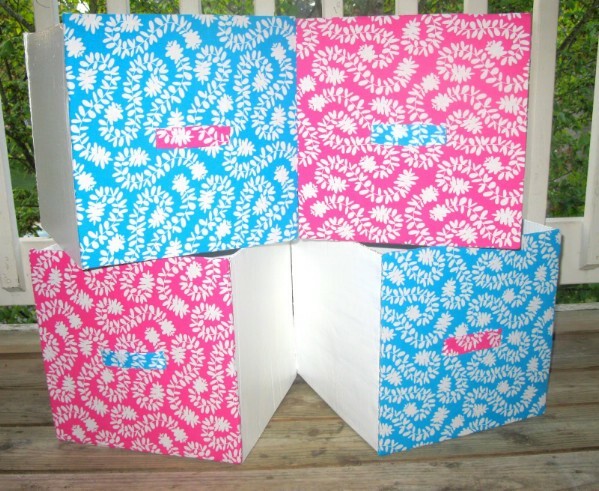 You can buy organizers for gift wrap but they tend to be a bit expensive. A cheaper solution? A shoe organizer. You can hang the organizer over the door and keep all of your wrapping paper, tape, scissors and bows in there. This works the same as those organizers designed to store gift wrap but comes at a much lower cost. A shoe organizer works great for keeping things in the car neat and tidy. If you have children, you probably have a load of things that you need to take with you when you go. 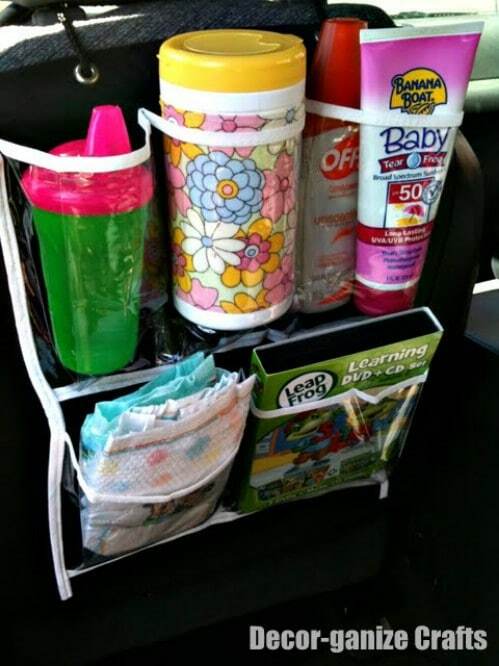 Small shoe organizers will fit all of those items and you can just hang them over the back of the front seat so that kids can get to what they need. 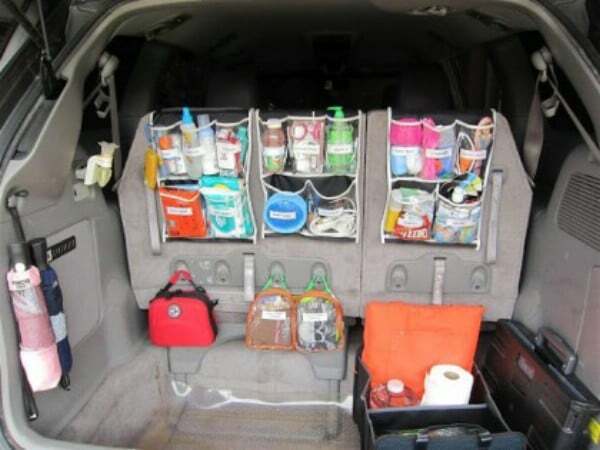 A couple of cheap hanging organizers and a few strategically placed Command strip hangers will help you to perfectly organize supplies in your car or minivan. If your kids participate in sports or you tend to take long trips, these little organizers can help to keep things put away in their place. 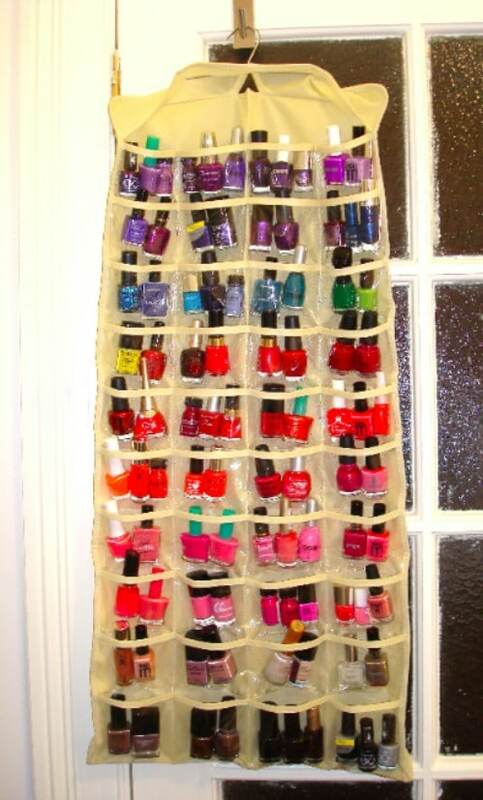 A hanging jewelry organizer is a great idea for keeping nail polishes organized. You can group them together by color and keep them in the pockets in whatever order you choose. You can also use a hanging shoe organizer and get the same result. They hang up on closet doors or the back of the bedroom or bathroom door so they stay out of the way and keep your polishes perfectly organized. Ziploc bags are definitely not just for storing food. If you are a crafty person and you tend to have several craft ideas just lying around the house, you can use Ziploc bags to keep those projects organized. Just insert the materials and instructions for each craft idea and zip it closed. The bags will protect your crafts and keep them together so when you are ready to do one, you just open the bag and get started. If you have tons upon tons of cookie cutters and you are tired of rifling through drawers and boxes to find the ones that you need, just group them together by whatever order you choose and keep them in Ziploc bags. Christmas designs for instance can be placed in one bag while Halloween or Easter designs are kept in another. Label the bags so that you know which one holds which cutters. 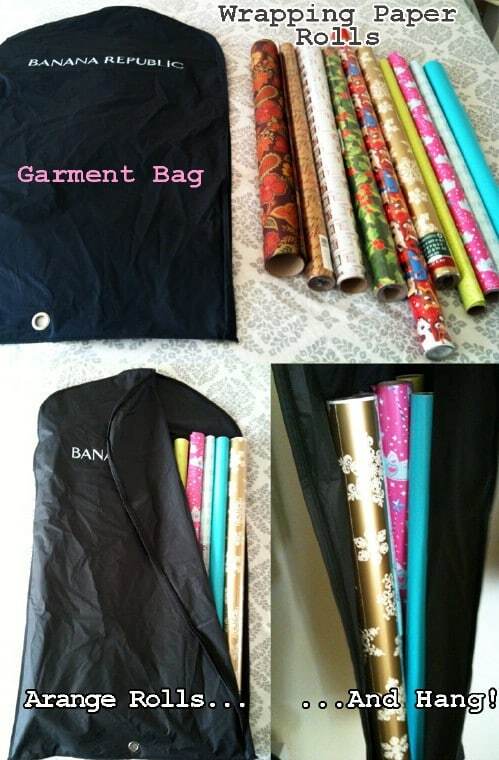 A standard garment bag is great for storing rolls of wrapping paper. Instead of keeping that paper in a box where it can be smashed, just put the rolls in a garment bag and hang it in your coat closet or wherever you have room. It takes up little space and will help to protect your paper from damage. 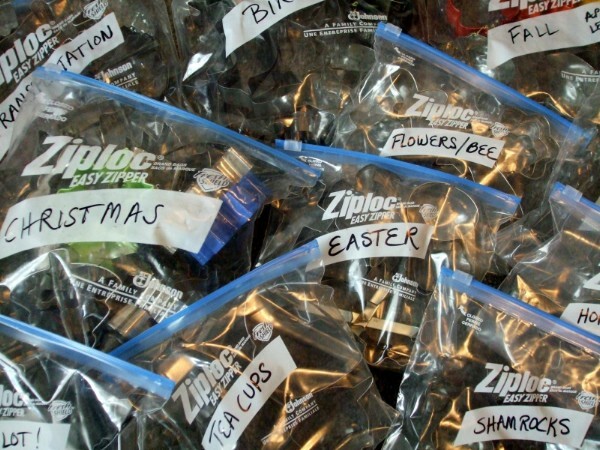 Ziploc bags can be used for any number of organization solutions. 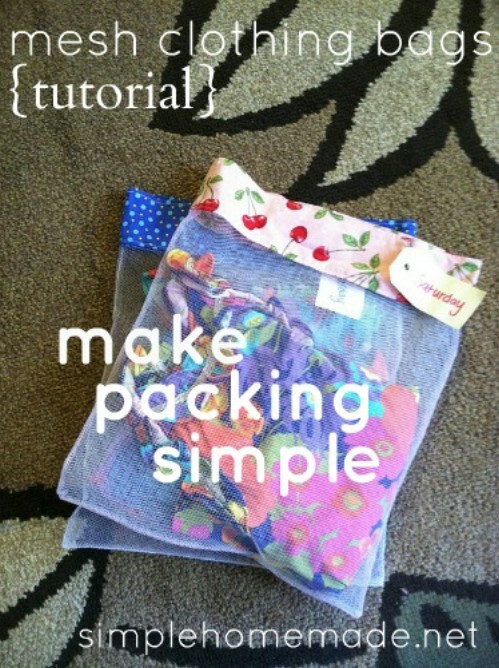 If you have craft supplies that tend to get lost or in the way, just keep them in Ziploc bags. You can group certain items together. 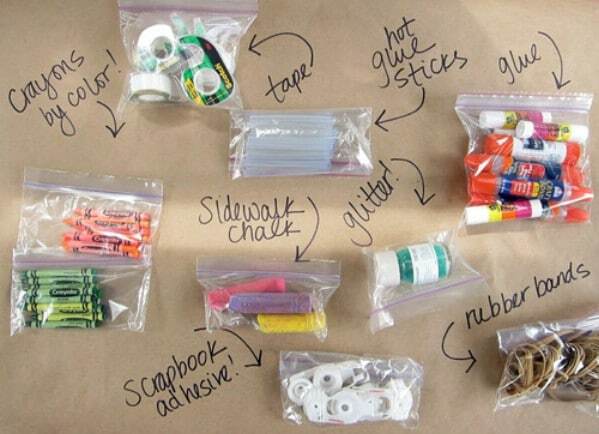 For instance, keep your glue and glue sticks in one bag, colored pencils in one and so on. You can write on the bags what goes in each one and then just keep them all together in your desk drawer, a plastic tote or a basket. If you need to organize medicines, spices or anything else in relatively small containers, an over the door shoe organizer works great. 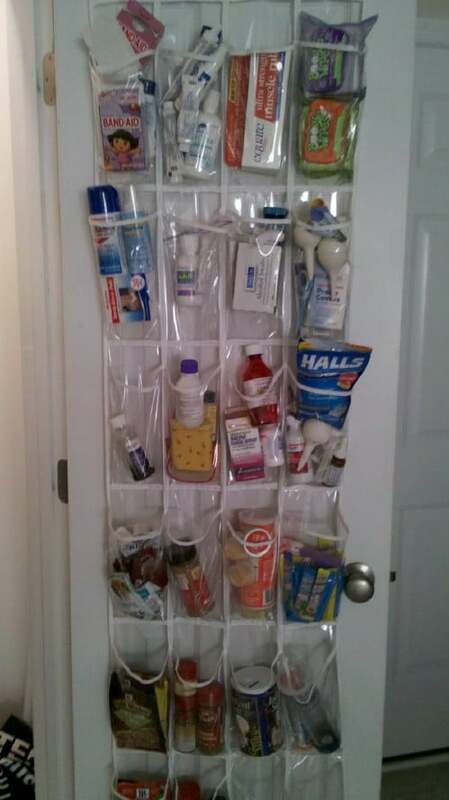 For medicines, you can simply fill the compartments with medicine and then hang the organizer on your bathroom door. If you need to keep spices organized, just put them in the slots and hang the organizer on your pantry door. Via: Mommylikesdeals – How to organize medicine, spices, and more! 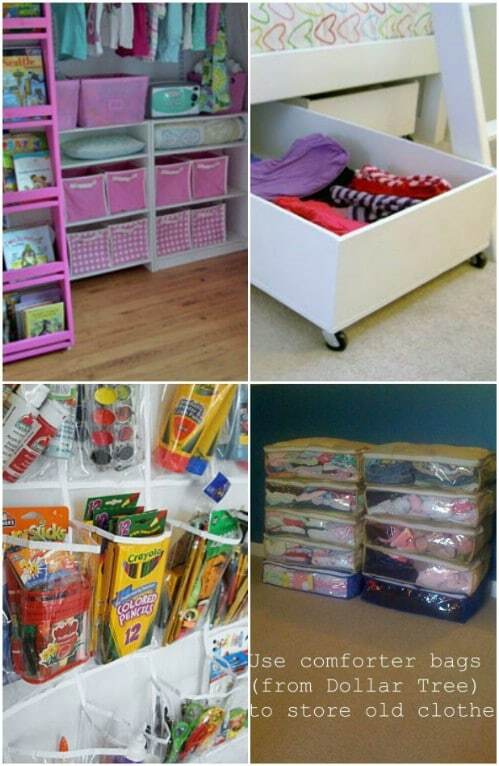 Organizing the playroom can be cheap, easy and fun. Zippered mesh bags are great for keeping puzzles pieces together and you can keep game pieces in Ziploc bags so that they don’t get lost. Finally, draw or print out labels that your child can color and use those labels on plastic bins to keep toys sorted. 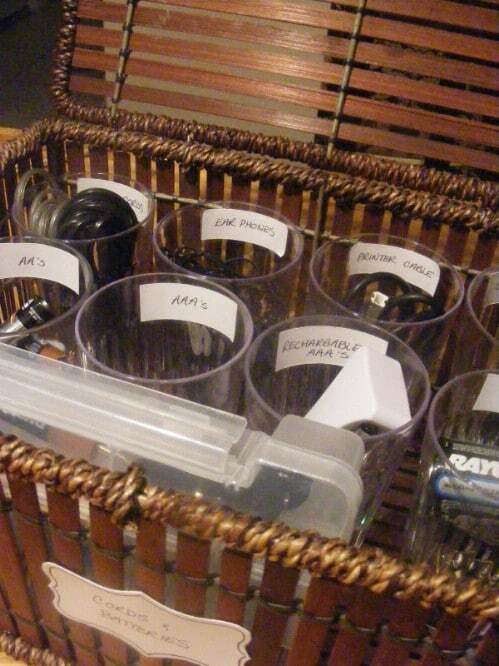 Not only is this a cheap and effective way to organize, your child will love helping to make labels for toy bins. Organization is important even when you are traveling, particularly if you are traveling with kids. 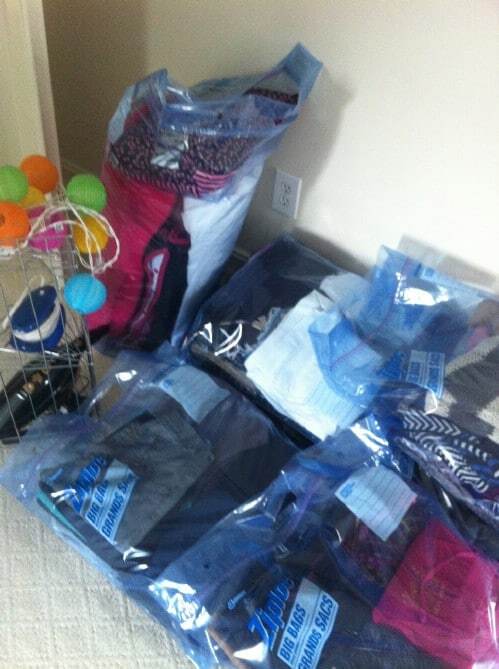 Mesh bags are cheap and work great for keeping certain clothing pieces together in the suitcase. If you have kids, you can pack an outfit for each day inside the bag so they will have everything that they need to get dressed each morning already laid out for them. 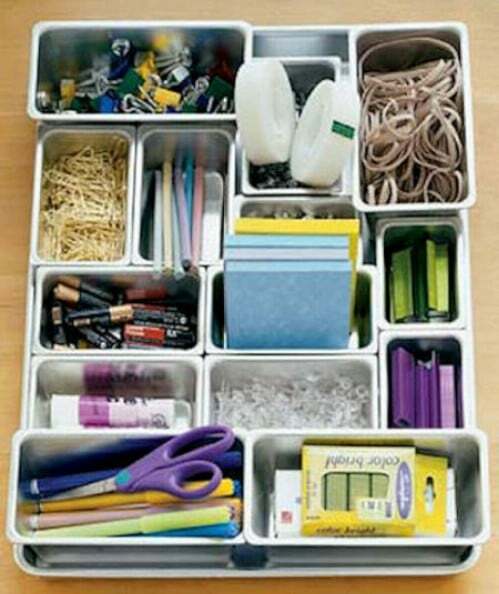 Small plastic containers are great for organizing lots of things. Some are small enough to fit inside a desk drawer and are perfect for organizing office supplies. You can also use them in the kitchen for keeping lots of smaller items from getting lost and in the bathroom for cotton swabs, bobby pins and loads of other smaller things. If you want a cheap, and very effective, way to organize jewelry, accordion hooks are a great choice. You just attach them to the wall and then you can use them to keep necklaces, bracelets and other jewelry items organized. They work great because they keep chains from becoming tangled and they look really nice on the wall. Plus, they are really inexpensive. 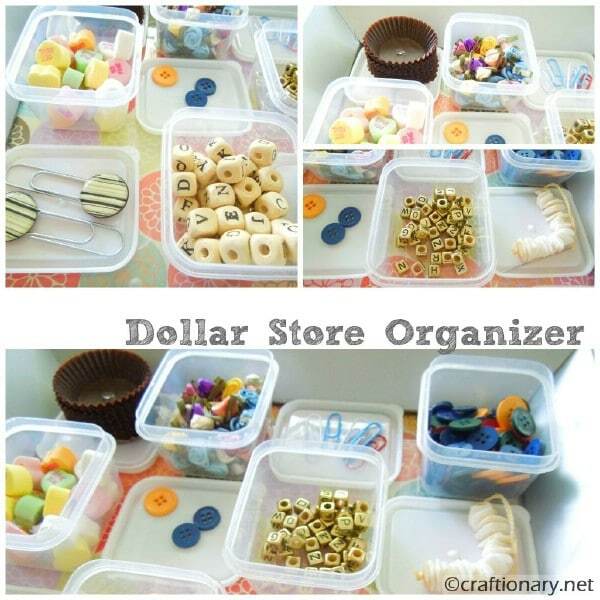 Via: Adorableantics – CHEAP Dollar Store Jewelry Organizer! Rags are not cheap. They can be however, if you make them yourself. Instead of buying rags for dusting and other tasks, just use old t-shirts. 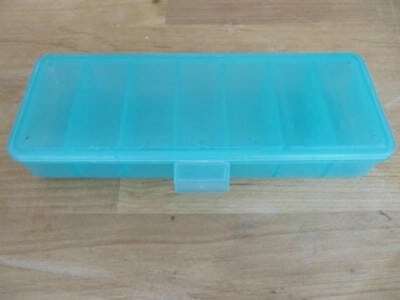 Ice cube trays run about $1 for 3 and they make the perfect organization solution for tool boxes and tool supplies. 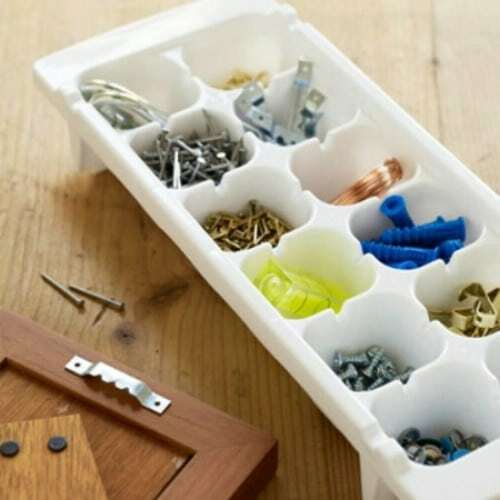 You can keep screws, nails and loads of other small items in the compartments and they stack perfectly so they take up little space. If you need to organize your smaller tool supplies, plastic ice cube trays are perfect. 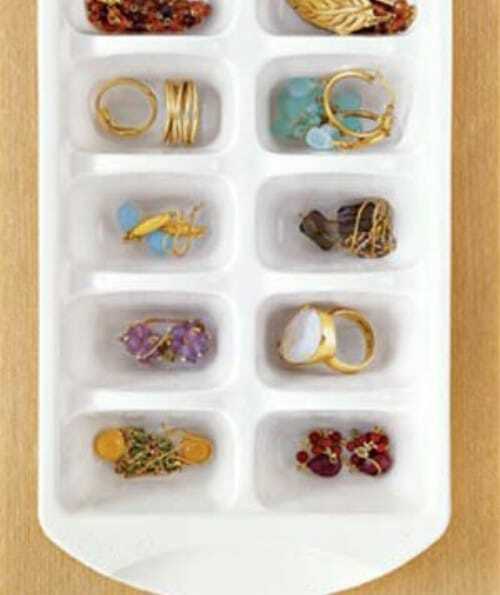 Jewelry can be stored in ice cube trays, which are very inexpensive. If you don’t have a jewelry box or your jewelry box is overflowing, you can use plastic ice cube trays to keep jewelry pieces separated. You can stack the trays in a drawer so they take up very little space and you can just lift out each tray to inspect it for the items that you need. 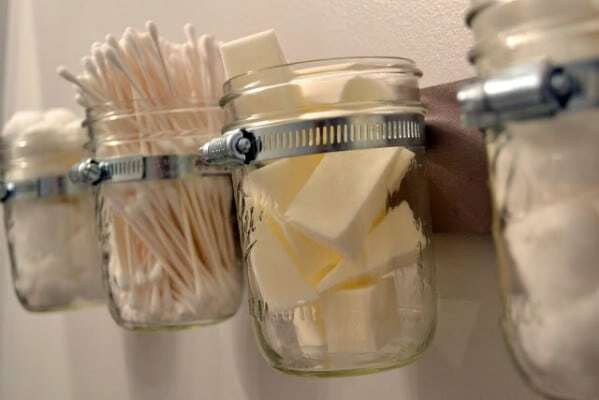 Mason jars are adorable storage containers and when you mount them to a piece of wood, they become a great bathroom organizer. The jars themselves are very inexpensive and in order to mount them, you just need a piece of wood and a few large pipe clamps. The clamps hold the jars perfectly in place so you get a unique and very functional organizing solution. 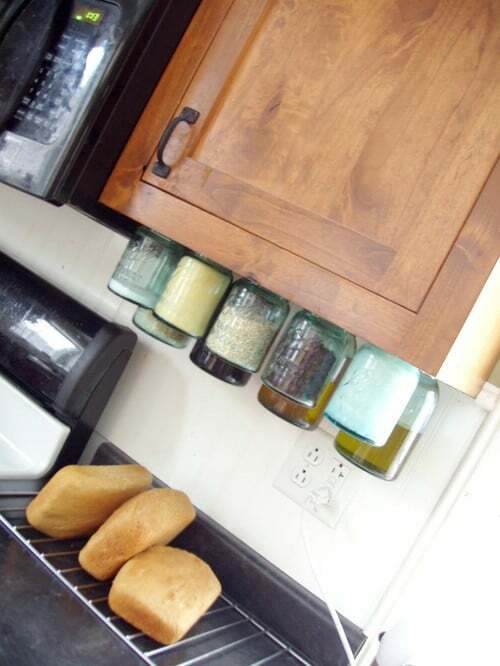 You can hang mason jars from the bottom of any cabinet easily. You just have to screw the lids into the underneath cabinet and then when you screw the jar back onto the lid, it will hang perfectly in place. 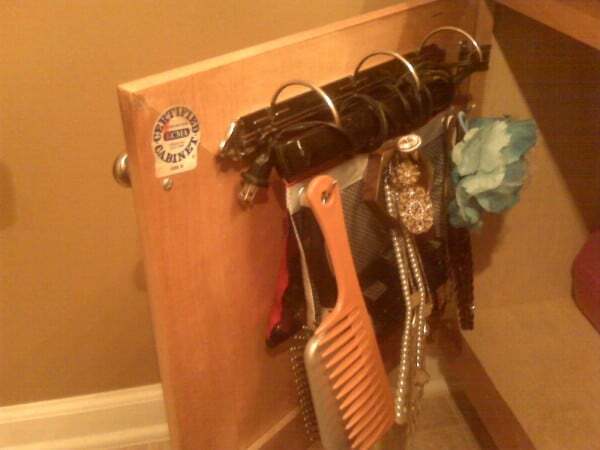 This is a great organization and storage solution for kitchens, garages or bathrooms. You can keep spices, toiletries or anything you need in the jars and they store under the cabinet so they save space. 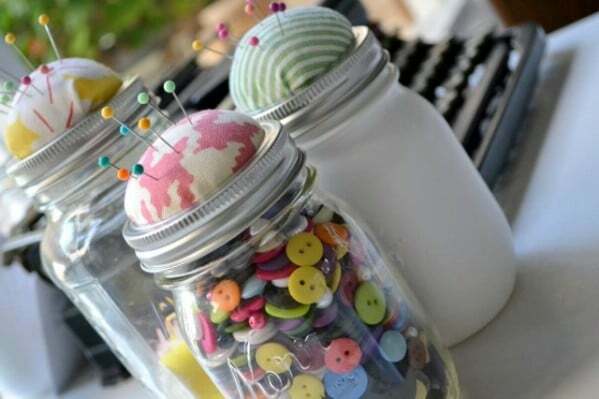 If you need organization for your desk and you love crafts, you can create beautiful jars with a little Mod Podge. You just need the Mod Podge, a few embellishments and some empty jars. 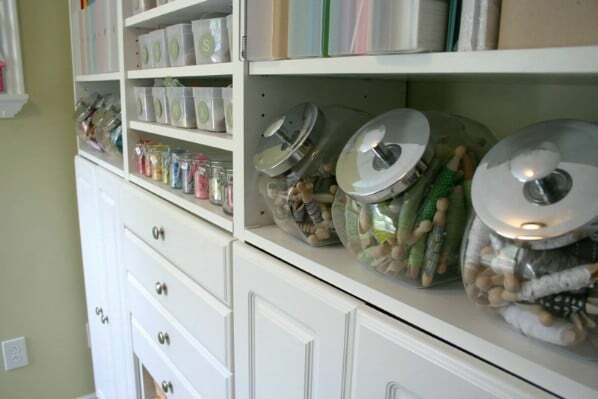 The supplies will cost very little and give you enough to do multiple jars so if you need organization in the bathroom or any other room, you should have plenty left to do those rooms as well. 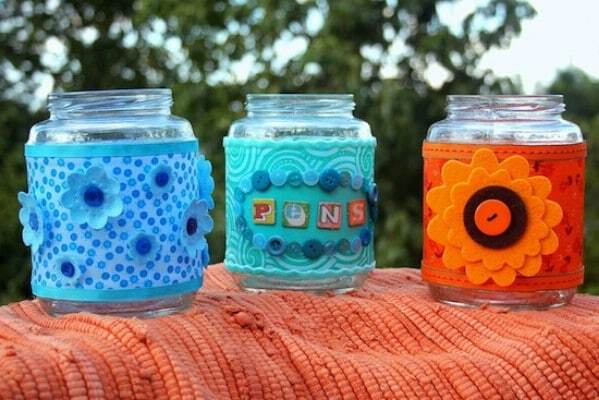 Via: Modpodgerocksblog – Recycled Mod Podge jars for your desk. 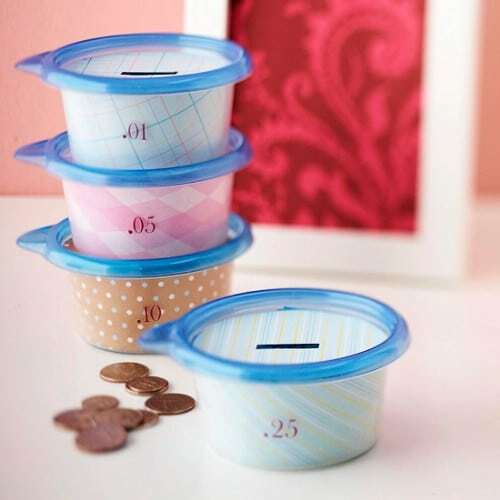 Small plastic food containers with lids make the perfect solution for keeping loose change organized. You can easily cut a slot into the top of the container and then label each one for the coin that is going into it. You can keep a container for pennies, nickels, dimes and quarters and then just roll them up when they become full. This is a great way to get the kids involved in saving and to teach them how to differentiate between coins. If you want instant organization, Command strips are a must. 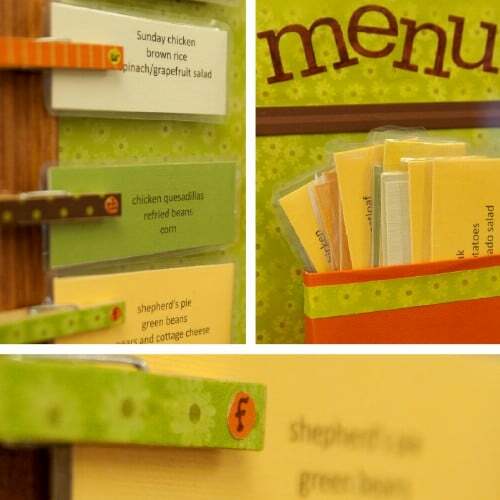 You can hang the strips virtually anywhere and they will enable you to keep a number of things perfectly organized. They are great for hanging keys and sunglasses so they are always near the door when you get ready to leave or use them to keep hair accessories, cords or anything else neatly in place. If you have multiple scarves and you need a good (and cheap) way to organize them, simply take a plastic hanger and add curtain rings. You can get plastic shower curtain rings for around a dollar or so. 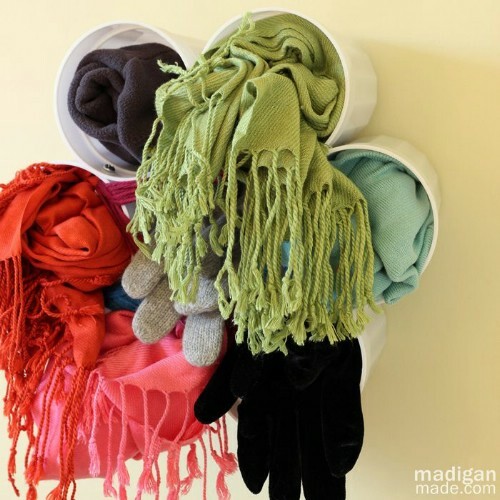 Just open them up enough to get them on a hanger and then place your scarves through the rings. 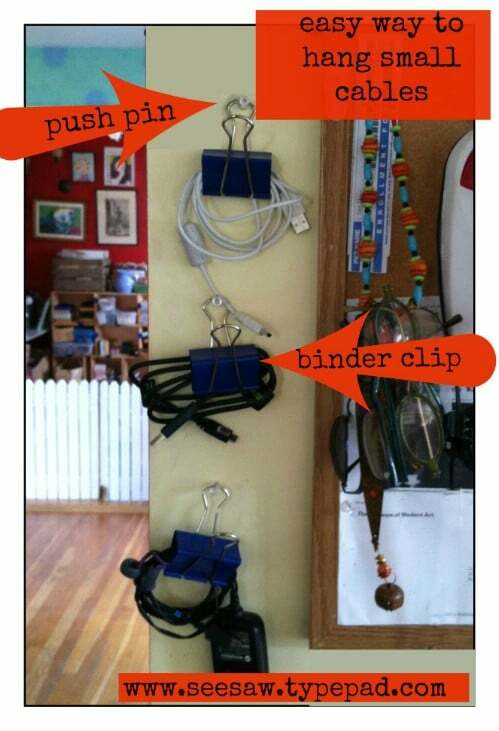 Hang your organizer in the closet or wherever you want. Did you know you can make a pin cushion from a mason jar? Well, you can and it’s easy to do. 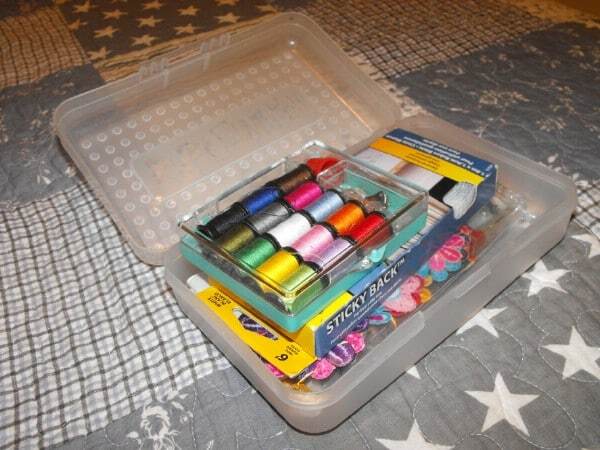 You can then store your sewing pins and keep them organized. Actually, you can make the pin cushion on top and then keep buttons, thread or anything else you need to store inside the jar. Make multiples if you have loads of sewing supplies. 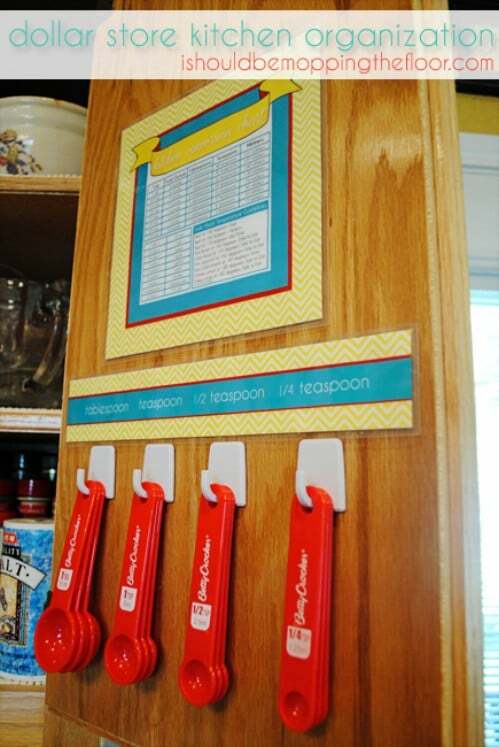 You can use command hooks to organize the measuring spoons and cups in your kitchen. Just attach the plastic hooks to the inside of a cabinet door and you have a great place to keep those items without them taking up drawer room. If you really want to be creative, add a strip that labels each hook and maybe a conversion chart for recipes. Elastic ponytail holders can really be a pain to store. They can take up so much room in a drawer and they get lost really easily. You can store them better on shower curtain rings. The ponytail holders will slip perfectly inside the shower curtain ring and you can group them together by color to keep them very well organized. Once you have them all together, just hang them from plastic hooks or put them back in a drawer. Organization for preschoolers is not nearly as difficult as it sounds. With just a few supplies, you can get your young one very organized which makes it much easier to get off to school each day. Things like baskets for schoolwork and school supplies for the day make it much easier to get out the door each morning. 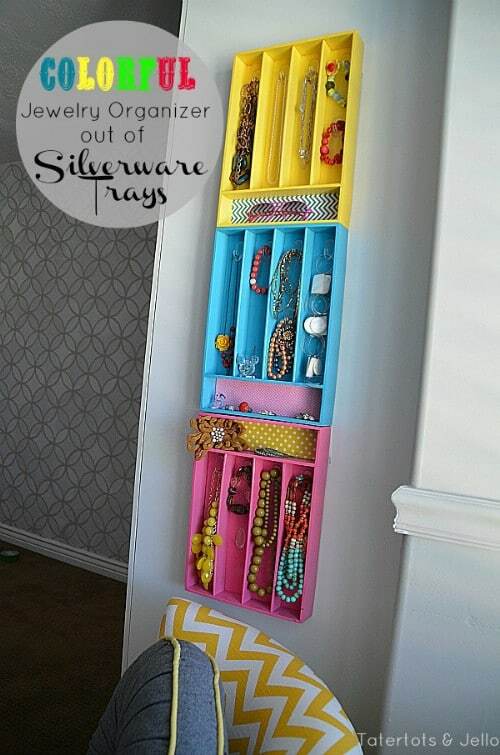 If you need a good jewelry organizer for your daughter’s room, colorful silverware organizers are cheap and work really well. 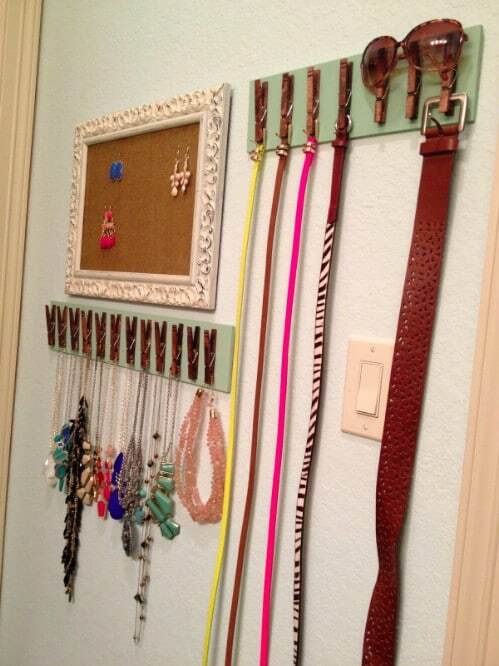 You just have to mount 2 or 3 on the wall and then add clear plastic hooks to the longer sections for holding necklaces and bracelets. 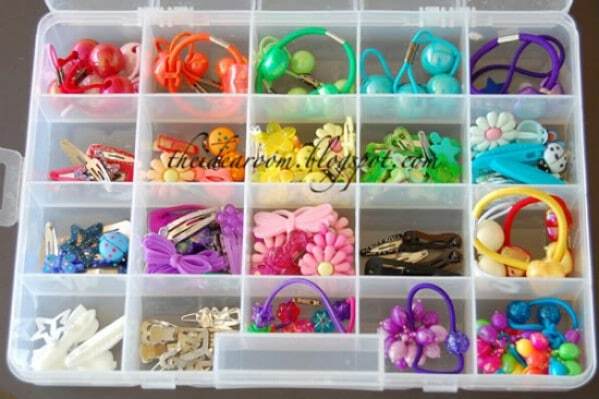 Multiple colors will look great and you can help your child to keep her jewelry neat and organized all the time. Keeping ribbons organized is not difficult, if you have the right supplies. A wire shower caddy works great for organizing and displaying wrapping ribbons. You can also keep loose ribbon in decorative jars or place wooden dowels inside small cardboard or plastic containers and keep your spools on there. 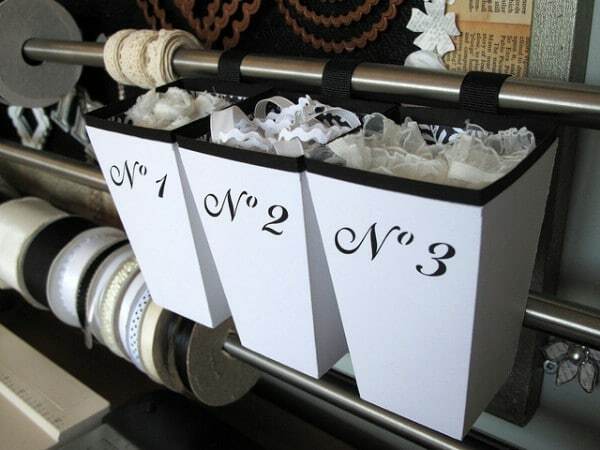 There are a number of ways to organize your ribbon, you just have to choose one. You can create a great recycling center in your pantry with just a couple of wire racks, a few baskets or buckets and a pegboard. You can put hooks in the pegboard to hold scissors and other supplies. Label the buckets or baskets for cans, plastics, etc. and use the wire racks for newspapers and magazines. Keeping everything separate makes it much easier to take it to the recycling center when you are ready. 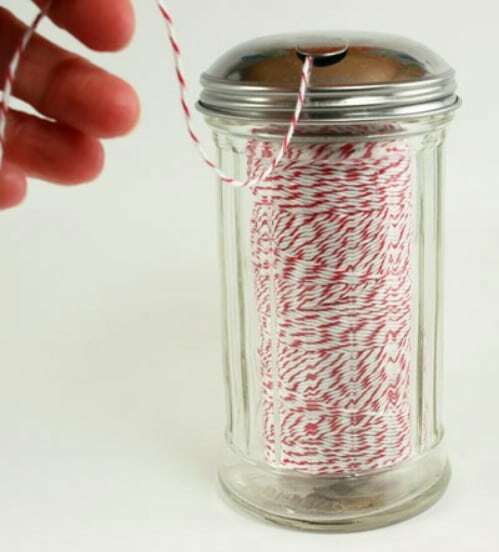 You can make your own dispenser for baker’s twine and even ribbon with a sugar dispenser. These can be bought for around a dollar or so and are perfect for keeping twine ready to use. Just run the end of the twine through the flap and it is ready whenever you need it. These dispensers are really inexpensive and make the perfect dispenser for your twine. If you want your spices to be a bit more organized, you can pick up small containers for about a dollar (this gives you 3 of them). 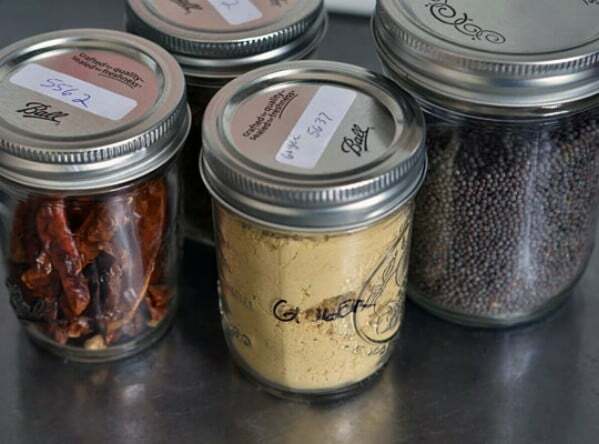 Just add your spices to the containers and then print out labels to keep them all looking good and so that you know which spice is in which jar. 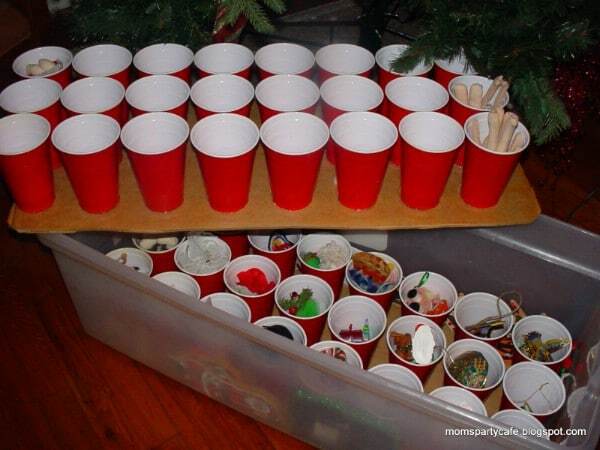 When it comes time to take down those Christmas decorations, you can keep them safe and organized by using cardboard and red plastic cups. 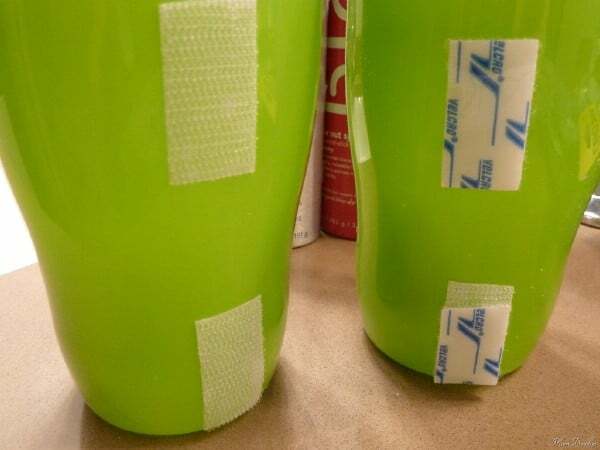 Just glue the cups to pieces of cardboard that will find inside your plastic storage totes. This keeps all of your decorations organized and because you can stack two or three cups on top of each other, you can store more in your container. 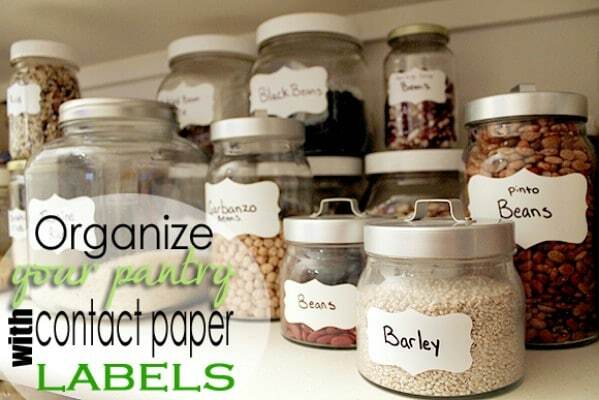 If you want your pantry to look perfectly organized, glass jars and contact paper are great choices. You can store dry goods in the jars and use contact paper to create beautiful labels so that you know what you have in each jar. If you need to change what you are putting in the jars, contact paper is relatively cheap so you can just peel it off and add a new label. 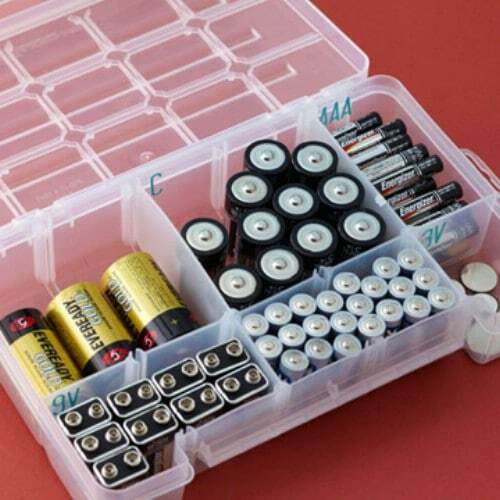 A small plastic tackle box makes the perfect battery station. The different compartments will enable you to keep batteries of different sizes separated and organized. This allows you to keep all of those batteries together so you don’t have to rummage through drawers looking for them when you need them. 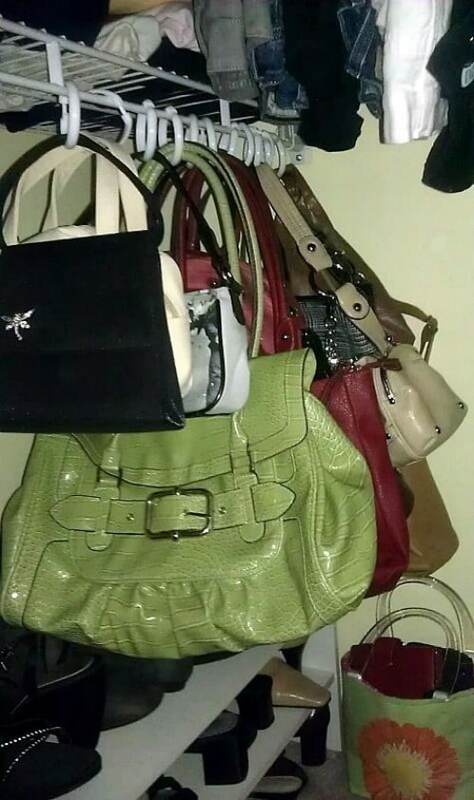 Chances are you have little space for storing all of those purses that you own. 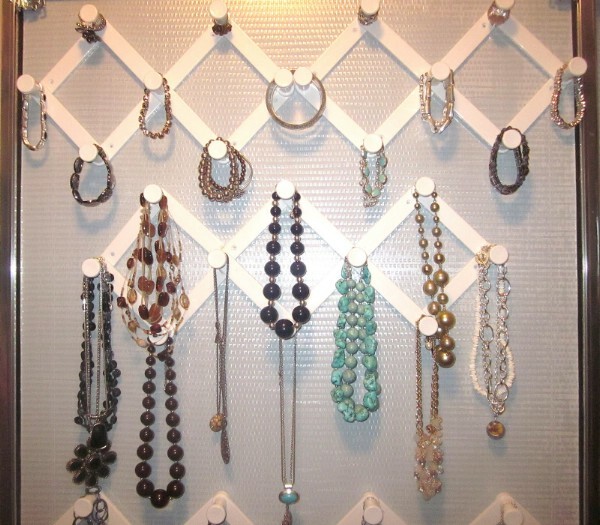 If you have a little room in your closet, you can easily store them using shower curtain hooks. Just run the handle of your purse through the hook and then hook them through the bottom of a wire shelf. The top of the shelf gives you additional storage area as well. If you don’t have room for another shelf, just hang the purses on their shower curtain hooks from the bottom of a hanger. If you have a pill organizer, you have the perfect place to keep bobbins organized. You just place the bobbins inside the individual compartments and you will always have them safe and tidy. When you need one, just pull it out and replace it with the one that you are removing from the sewing machine. Via: Sewmanyways – Tool Time Tuesday…What’s In Your Medicine Cabinet? How many buttons do you have just thrown down in the bottom of your sewing basket? How about in a junk drawer? 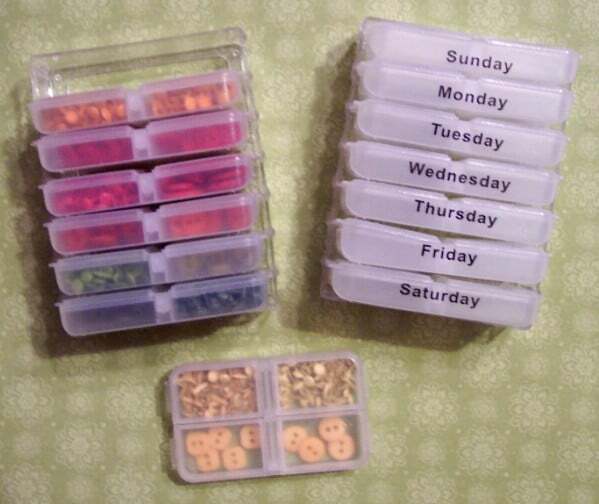 You can better organize those buttons with a pill organizer. 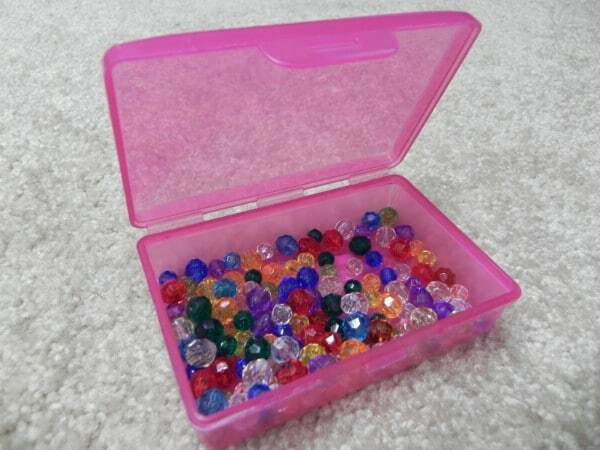 Just fill each compartment with buttons that are the same or similar (same color, size, etc.). You can keep many different buttons in each organizer and you will always be able to find the one that you need. Shower racks and command hooks will help you to instantly transform your mud room into a clutter-free zone. Just use the hooks for hanging up coats and you can use shower racks to keep hats and gloves in place. You could also use larger hooks if you want somewhere to hang shoes so that they can dry after being out in the rain or snow. 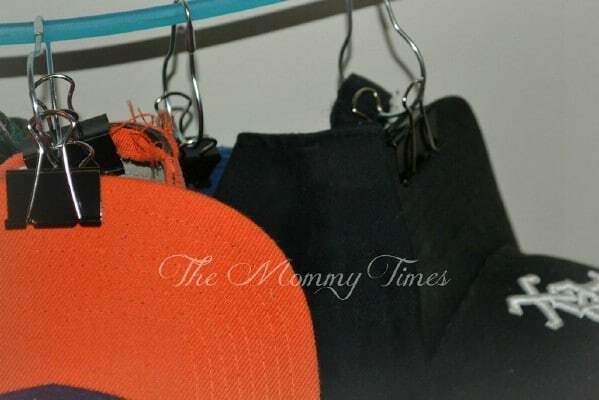 If your husband tends to have many baseball caps and you want to keep them organized, all you need is a hanger and a few office clips and binder rings. Clip the bill of the cap and then run the clip through the binder ring. Once you have all of the hats clipped, you can just add them to a hanger. Stand-alone popsicle molds are great for keeping crayons organized by color. If your child doesn’t particularly care if their colors are organized, you can also use the popsicle trays for just keeping them organized in general. These trays are really inexpensive and perfect for keeping crayons and other items separated. 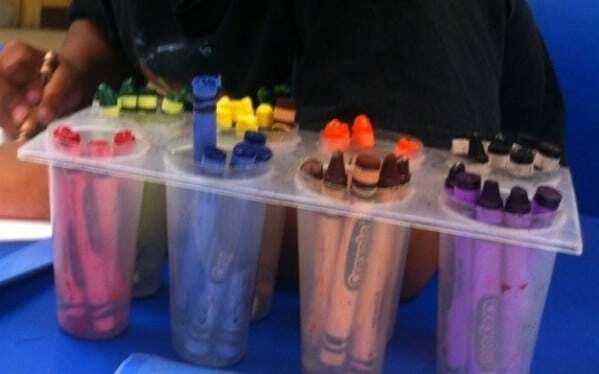 Via: Buzzfeed – Organize crayons by color with popsicle trays. A memo board will help you to keep everything organized from your schedule to your menu. All you need to make one is a burner cover and a bit of imagination. You can decorate it however you want and then add a ribbon to hang it. 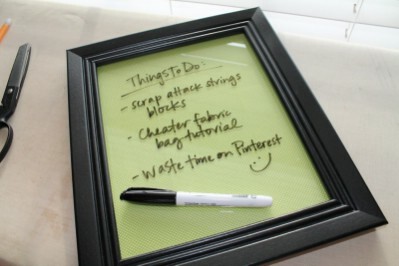 You could even go so far as to paint it with chalkboard paint so you can just jot down your memos with chalk. 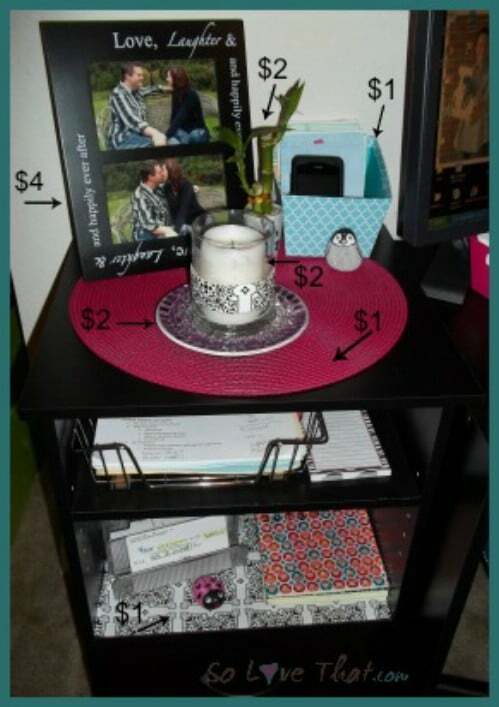 Via: Madiganmade – Magnetic memo boards: made from the dollar store! Plastic cups from the Dollar Store are really cheap. You can usually get 3 or 4 for around a dollar. You can use these cups to keep scarves, gloves and other items neatly organized. Just screw the cups together and affix them onto the wall with a wire hanger and then you have very unique shelves that will perfectly hold those scarves. 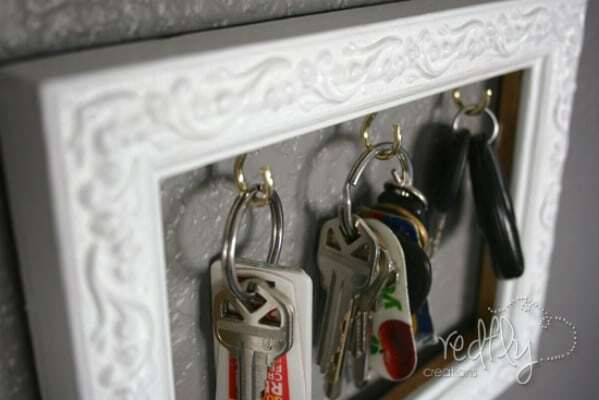 An old picture frame and a few small cup hooks can be turned into a great place to keep your keys organized. Just remove the glass from the frame and insert the hooks to hang your keys. This not only keeps keys organized, it looks great and if you don’t have a frame that matches your décor, they are really cheap. You could even decorate the frame if you want to make it really unique. Via: Redflycreations – Frame a Place to Hang Your Keys! If you tend to sew a lot, then you probably have loads of fabric sitting around. A great, and cheap, way to organize your fabric is to simply wrap it neatly around a piece of cardboard and then keep it in a plastic tote, basket or even a magazine holder. Plastic pencil boxes are normally around a dollar each and during back to school days, you can pick them up even cheaper than that. These little plastic boxes are perfect for keeping sewing supplies, makeup brushes and other items organized and you can stack them so save even more space. 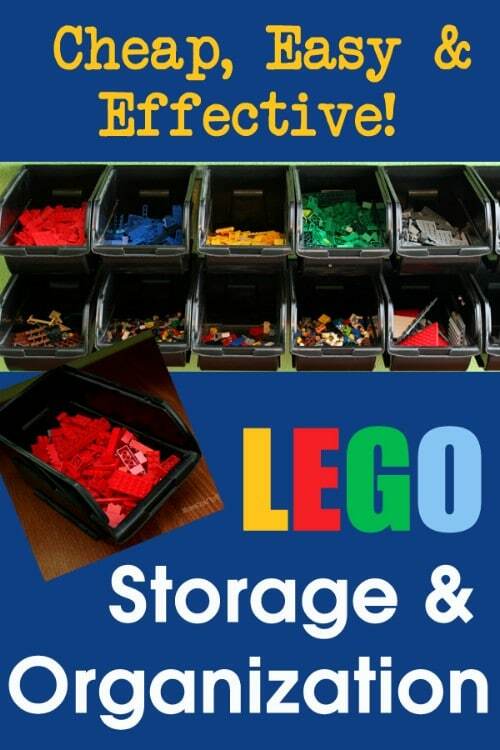 If your child loves Legos, chances are you have stepped on at least one. Instead of keeping them in the toy box or on the floor, give your child a special place for them. 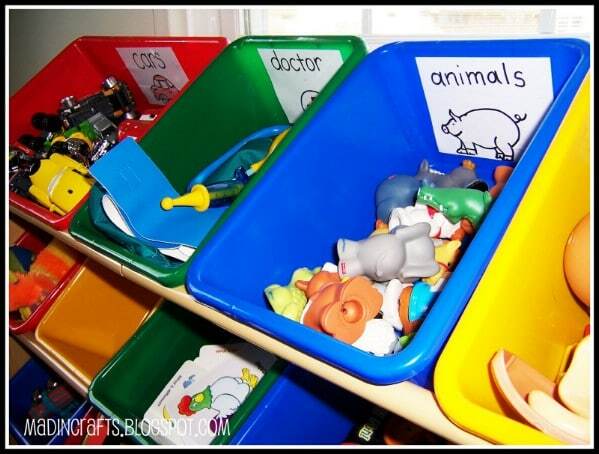 Small plastic bins attached to the wall is great storage for smaller toys and will keep them better organized. If you have room, put up bins for all of their toys and really get them organized. 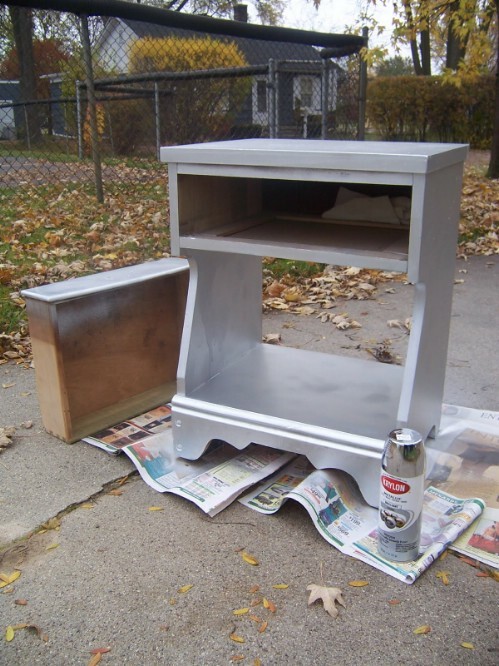 CIf you have an old dresser, you can use it to get your mud room perfectly organized. You don’t actually need the drawers, just paint it and add some cheap baskets from the Dollar Store. 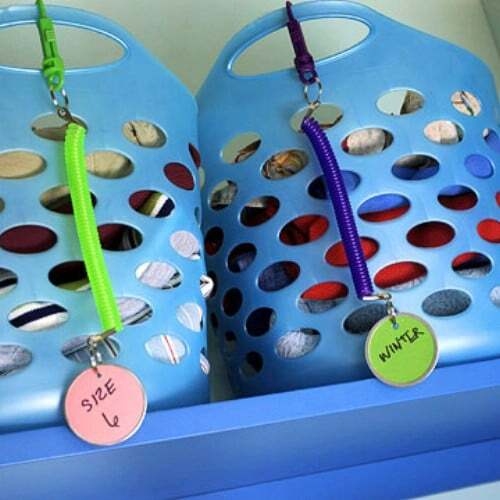 Label the baskets with kids’ names or clothing item so they know where everything goes. If you have solid cabinet doors in your laundry room, you can replace those doors with pegboard and use that pegboard for perfect organization. Just get a few hooks and plastic containers from the dollar store and you can keep things stored right in the door to save space. All of your small brushes and other smaller items will have their own little container. 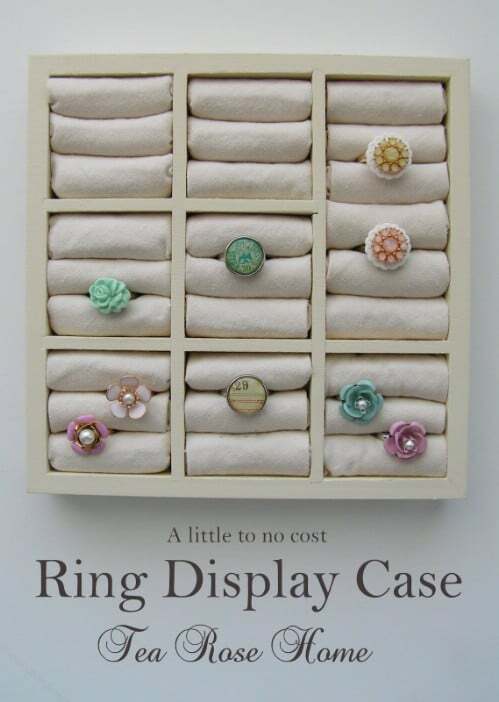 A cheap frame that you can get for less than a dollar can be turned into a beautiful ring display. 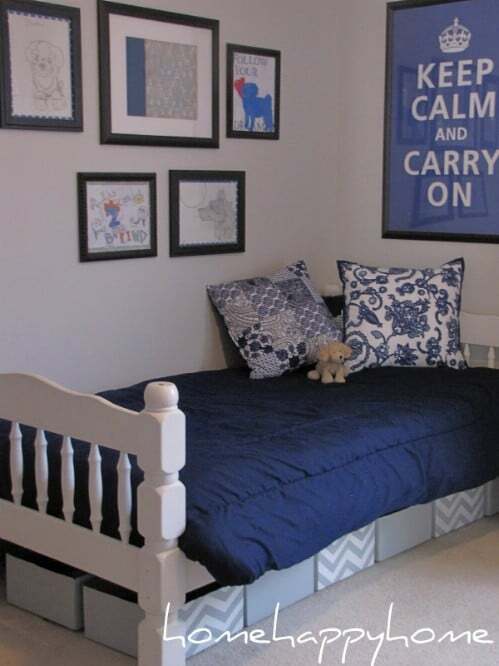 You will need a frame that has multiple sections and a bit of fabric. You just roll the fabric and stuff into the sections, about three rolls per compartment. This holds your rings and keeps them organized and it looks great hanging on the wall. 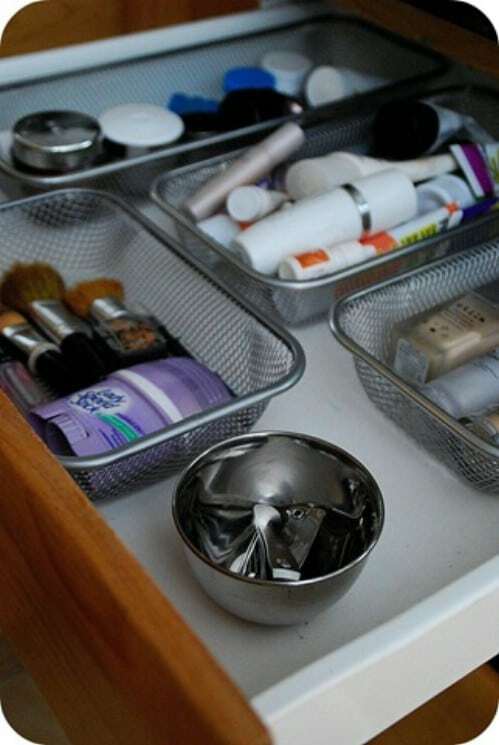 You can find loads of cheap ways to organize your dresser drawers. While they make organizers, these can be a bit expensive. Canvas pop-up organizers are great and really cheap compared to some others. You can also use small mesh bags to keep certain delicates separated and protected and to get your drawer completely organized. If you have potatoes and onions in your pantry that tend to roll everywhere, you can keep them organized better by simply storing them in wire baskets. The baskets are really cheap and work great because they allow air into your produce so it will last longer. Plus, they just look really good in the pantry. Via: Kitchenstreasures – It’s Wednesday! Time to organize something that has been driving me crazy!! 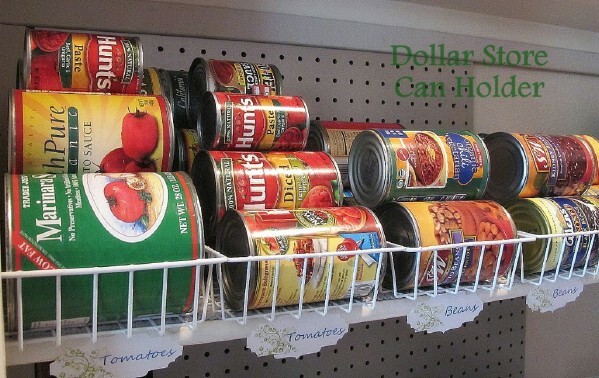 A few wire racks or baskets from the Dollar Store (that cost very little) will help you to perfectly organize the canned food in your pantry. You can label the baskets so that you know what goes inside each one and then just lay cans down so that they stack. This saves space and makes it much easier for you to grab what you need. 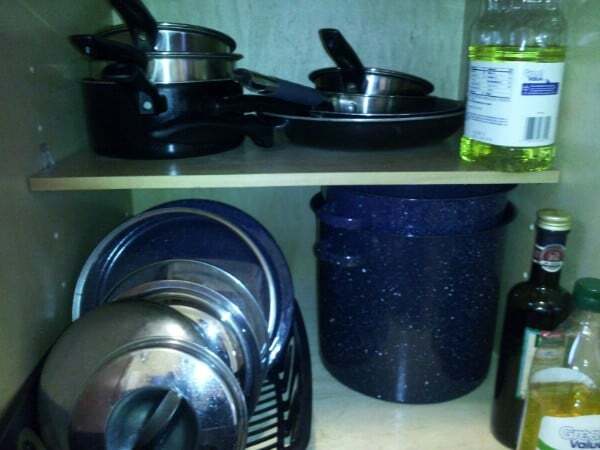 To organize the lids to your pots and pans, you just need a very inexpensive dish drainer. These are normally under $5 each and are the perfect tool for keeping those pot and pan lids neat and tidy. The slots in the drainer will ensure that lids stay put and makes them much easier to get to when you need them. Via: Wadinginthewonderful – Kitchen Organization for Cheap! 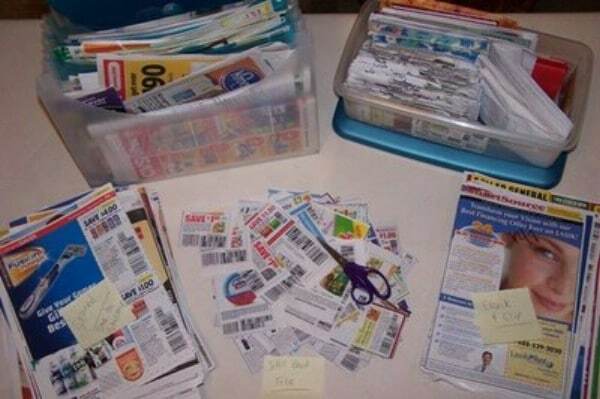 You can make a great organizer for your coupons using a file organizer and just a little hot glue and Velcro. 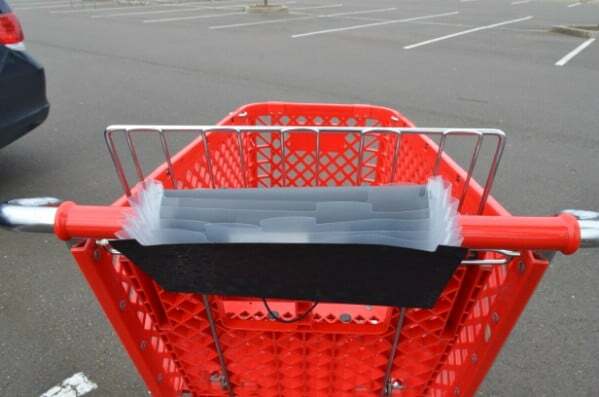 The great part is that you can take this organizer with you when you shop and it hooks over the handle of the cart so you don’t have to hold your coupons and it makes it easier to find them when you need them. If you have a large toy box or an ottoman that you keep toys in, you can decrease the clutter by adding a few plastic crates. 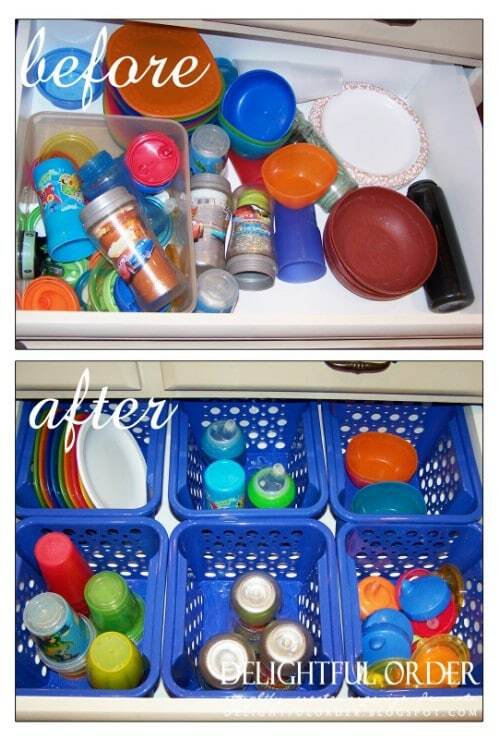 This helps you to keep those toys organized so you can sort them out and separate them by type or by child. 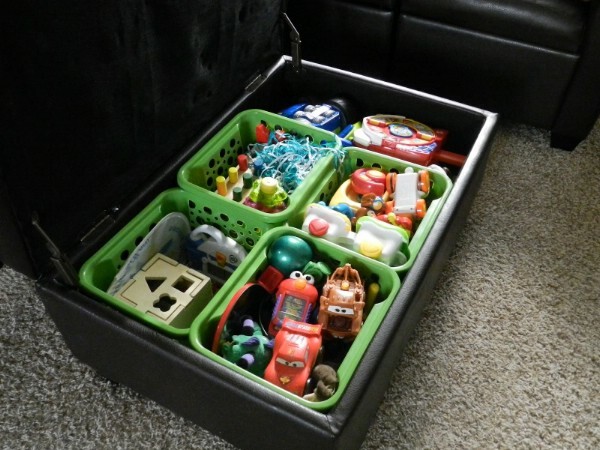 This is a great and inexpensive way to keep toys organized. 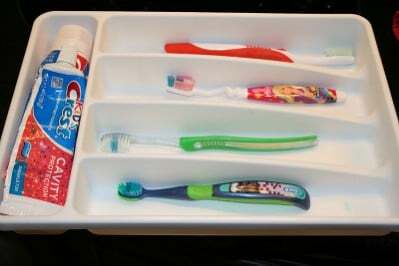 You can make a really useful toothbrush organizer from a silverware organizer. You just have to place it in your drawer and that’s it. You can write in the names for each of your household members so that they know where their toothbrush goes and if you have fewer than 5 people in your house, you will also have a slot for the toothpaste. Those little plastic soap boxes that you can get for less than a buck at any Dollar Store will make a great storage container for your playing cards. They also work well to keep crayons and other smaller toys organized. 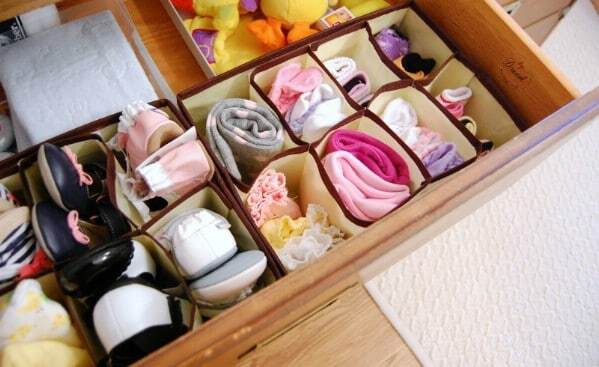 And, because they are so small, you can store them in dresser drawers or small baskets for even more organization. Small toys, like those micro cars and tiny dolls, can get lost really quickly. 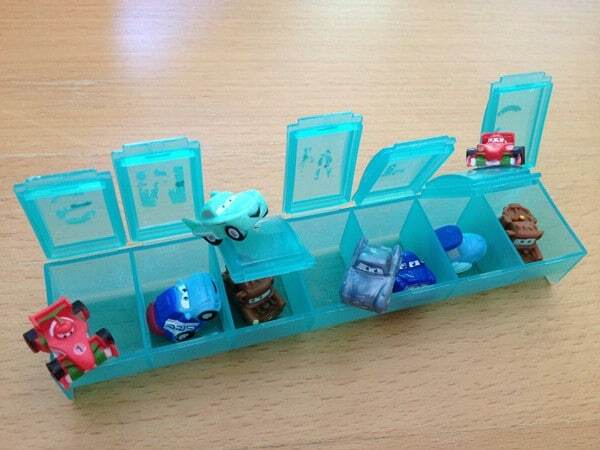 A simple pill dispenser will keep them organized and ensure that they don’t get lost. The pill dispenser works great and is the perfect size for most smaller toys. Plus, it’s pretty small itself so you can have several of them stacked up and save space. Noodles make great boot fillers. You know, those foam noodles that the Dollar Store sells during the summer. Well, they cost around a dollar each and you can cut them to perfectly fit into the tops of your boots. This will hold those boots up and help you to better organize your closet space. 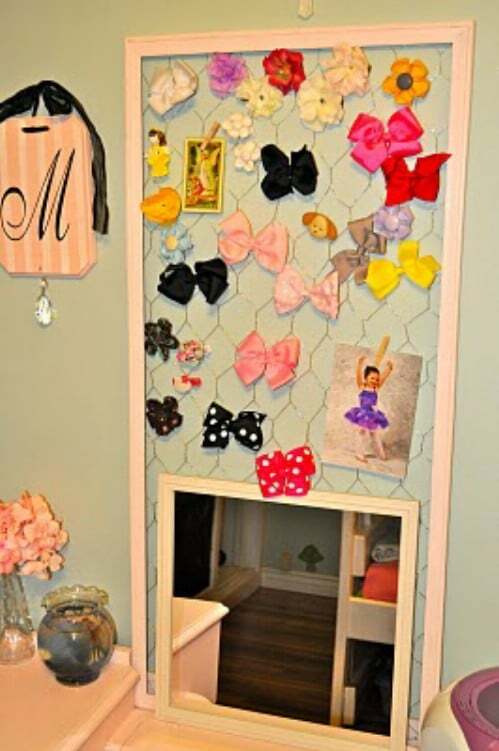 You can attach a ribbon to the back and hang them anywhere so you have organization wherever you need it. Labeling them is also a great idea and because they are so inexpensive, you can use several of them to get the job done. If you are a mom or a grandma, you likely have many sippy cups and lids in your kitchen. The problem comes when you can’t find the right lid for the sippy cup in your hand. Some inexpensive plastic baskets from the dollar store can help. You just keep the cups in one basket and the lids in another so that you can always find what you need. If your child has several pencils, crayons and other craft related items in their room, you can use small buckets to clean up that clutter. The buckets are really cheap and come in a wide range of colors. 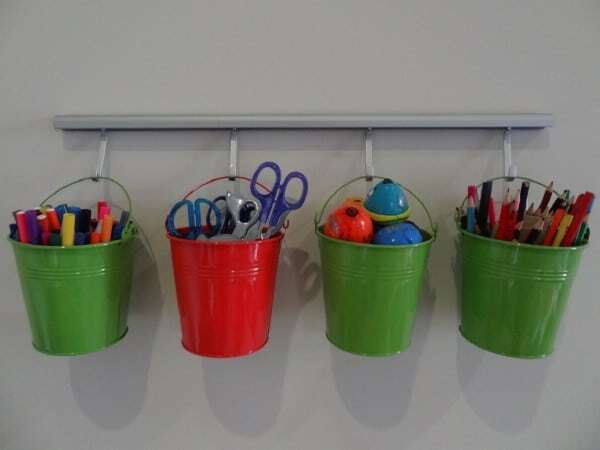 If you put up a few plastic hooks, you can hang the buckets on the wall and keep those pencils and crayons off the floor. Dry erase boards are great for keeping the family notified of certain things. You can use them for your grocery shopping list, to keep track of appointments or just to leave the family a little note each morning. You can make a really nice and cheap one using a standard picture frame and a little fabric. If you quilt, then you may need organization for those quilting projects. A few cookie sheets (that cost about a dollar at the Dollar Store) will work nicely. 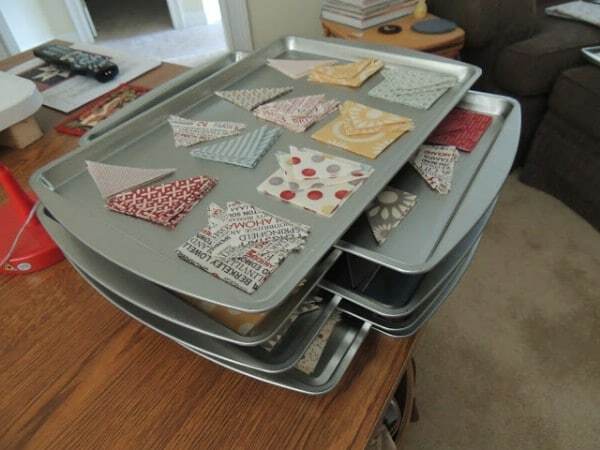 Just arrange the pieces on the cookie sheet and then stack the sheets so that your quilting projects are always right there when you are ready for them. Foam door hangers make great separators in your closet. 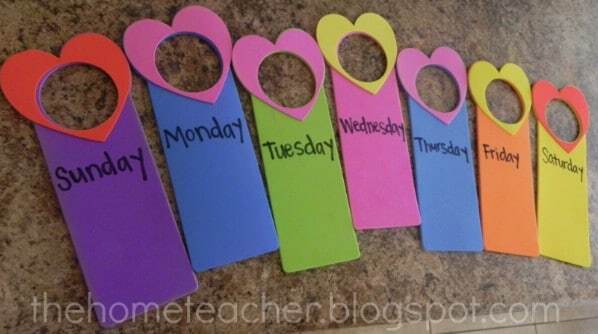 You can also use them to keep your little ones organized throughout the week. Just hang their outfits for specific days together and place a foam hanger with the name of that day written in sharpie. This way, they know what they are wearing for every day of the week which saves time getting them out the door in the morning. 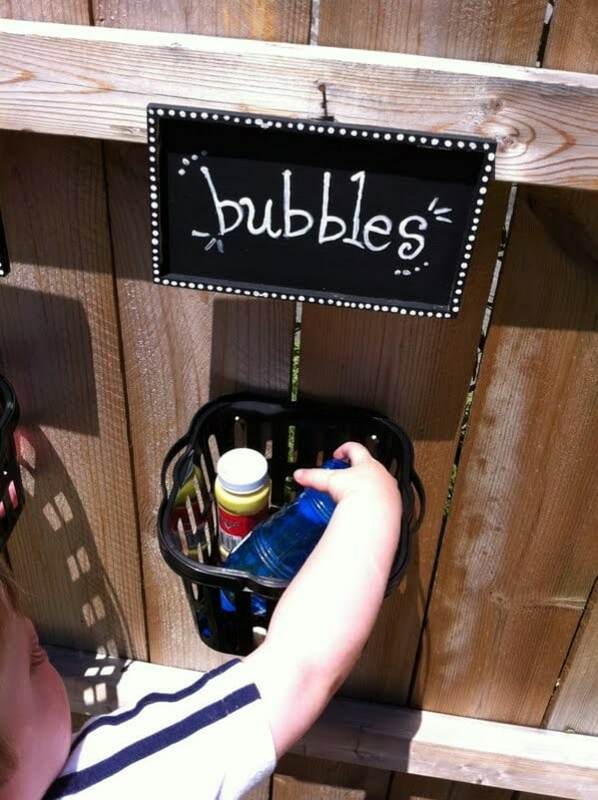 A few plastic baskets, hooks and a label or two will give you the perfect way to organize your outdoor toys. Hang baskets off your porch or deck and label them with what goes inside. Hang them low enough so that your children can reach them and they can learn how to clean up and organize a bit themselves. You can pick up a small utensil holder that goes along with picnic supplies and use that to keep snacks organized when you are on the road. The compartments are great for crackers, string cheese and other snack foods and the holder can be passed around from child to child without having to rifle through bags and boxes. You could even stick some wet-naps in there for cleanup after their snack. Via: Theharrissisters – Mess Maker, Mess Maker Make me a Mess! A few plastic cups and a muffin tin make great, and cheap, organization solutions. 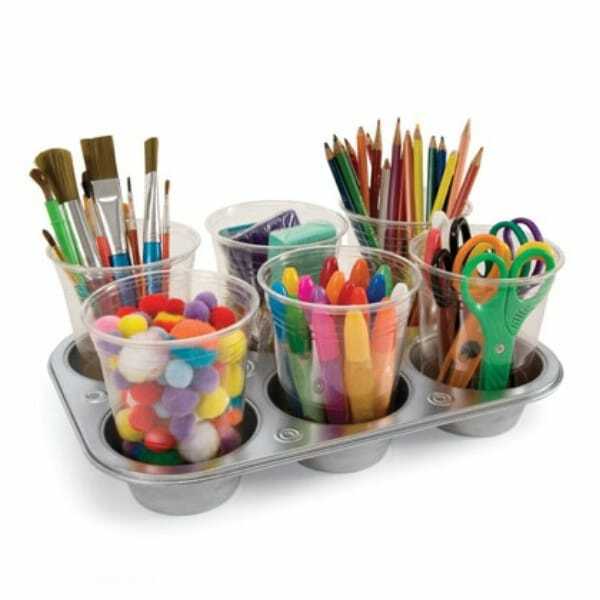 You just have to put art supplies in the cups and use the muffin tin to keep them neat. 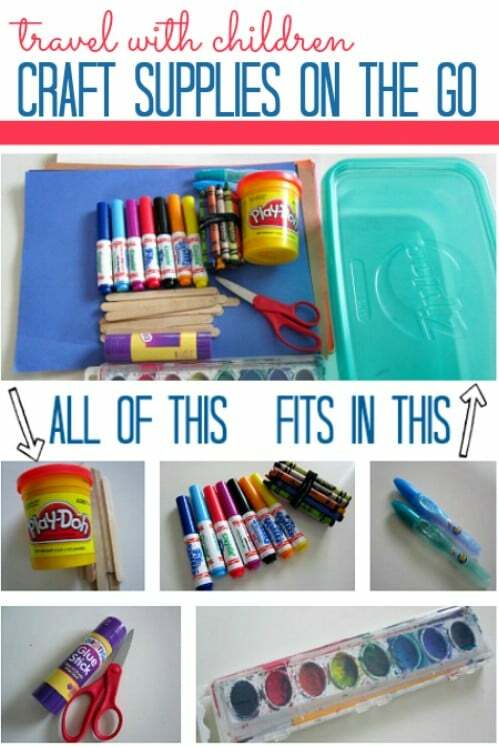 This is a great way to keep scissors, crayons and other art supplies off the floor and out of the toy box and it looks really cute so your kids will love it. A simple plastic mop bucket and a tool belt are all you need for great craft supply organization. You just hang the belt around the bucket and use the slots for crayons, paints, brushes and other items. 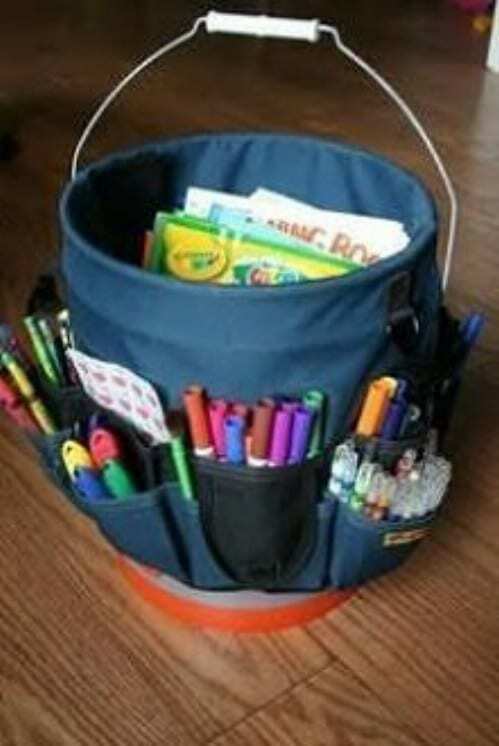 The bucket is great for holding larger items like coloring books, paper and even a small easel. 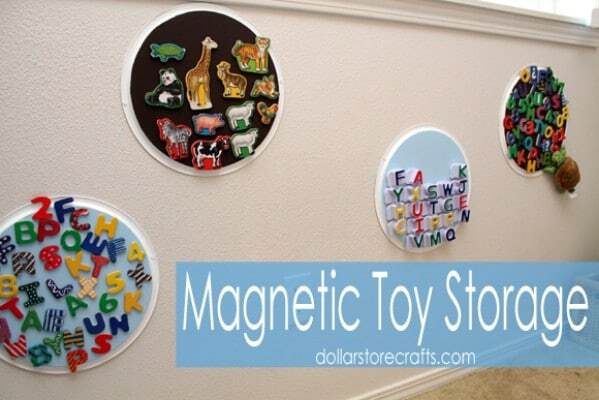 Kids love magnetic toys but unfortunately, they can get lost pretty easily. A couple of pizza pans and some paint and you can have a great organized place to keep those magnets without spending a fortune. Paint them whatever color you want and then attach them to the wall with screws. This will keep those little magnetic toys in their place. 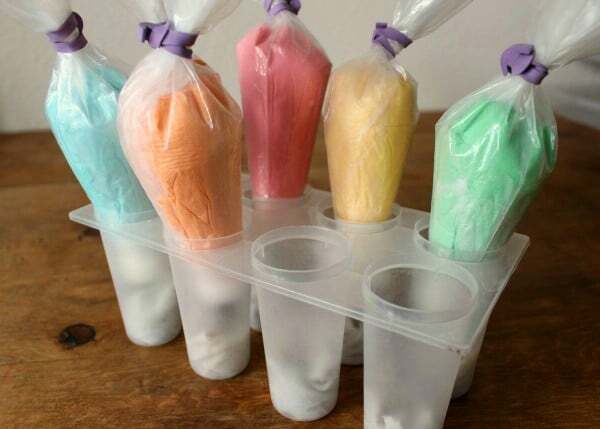 If you love decorating your own cakes and you tend to use multiple colors of icing, a great way to keep those bags organized is to use a popsicle tray. These are very cheap and the perfect size for icing bags. Just drop the bag into a compartment and leave it until you need it again. You may want to stick a piece of paper towel or rag into the compartment first to ensure easy cleanup. Plastic cups, that you can get for about 30 cents each, are great for keeping bathroom hair supplies organized. You can just use Velcro to mount the cups to the inside of your cabinet door and they will hold your curling or straightening iron along with other items. 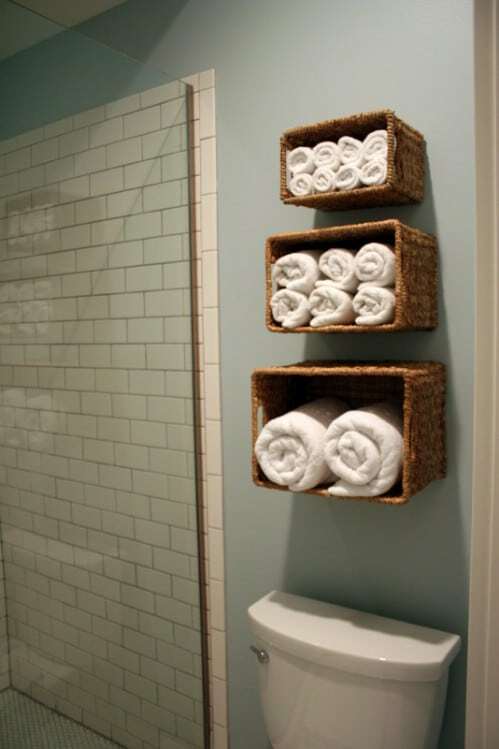 You can get multiple sizes to store different things and keep your whole bathroom organized. Instead of leaving ribbon lying in a drawer, why not give it its own little space. 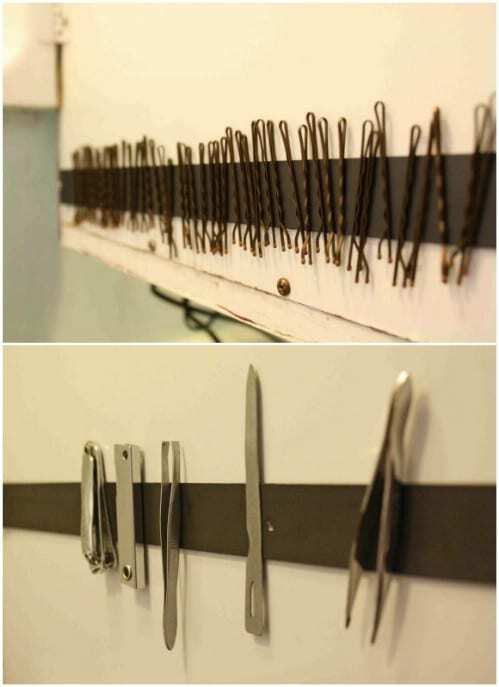 A jar and a few old fashioned clothespins make the perfect organization for those spare ribbons. 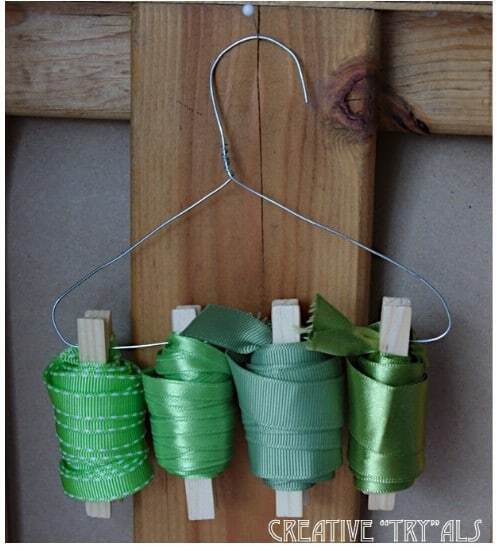 Just wind up the ribbon onto a clothespin and then store the rolls in a jar. You can use smaller jars and store the ribbon by color as well, if you want. What’s a better way to keep those hair styling tools neat and tidy than with a file folder. You can pick these up for a little of nothing and when you mount them to the inside of your bathroom cabinet door, they make the perfect spot to keep blow dryers, curling irons and straighteners. 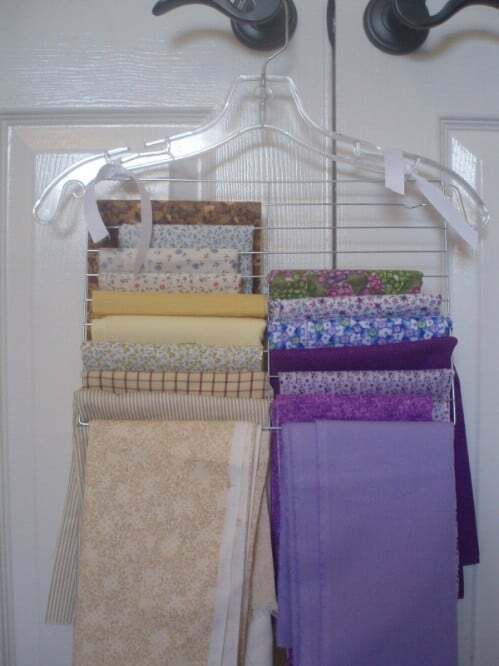 A wire cooling rack and a hanger make the perfect combination for keeping fabrics organized. If you tend to quilt or sew, you probably have loads of fabric piled up. Using a coat hanger and a cooling rack, you can create a place to hang that fabric so it stays organized and neat until you need it. 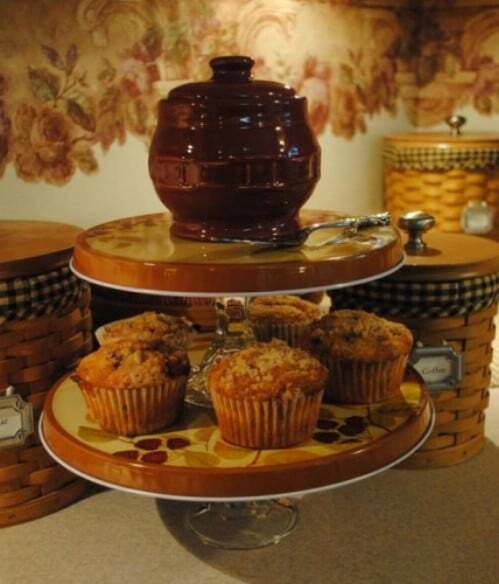 A simple cake stand, some stove burner covers and a little glue gives you the materials needed to create a beautiful organization stand that you can use in any room. This is great for keeping fruits and veggies organized or you can use it on the bathroom counter for makeup or jewelry. 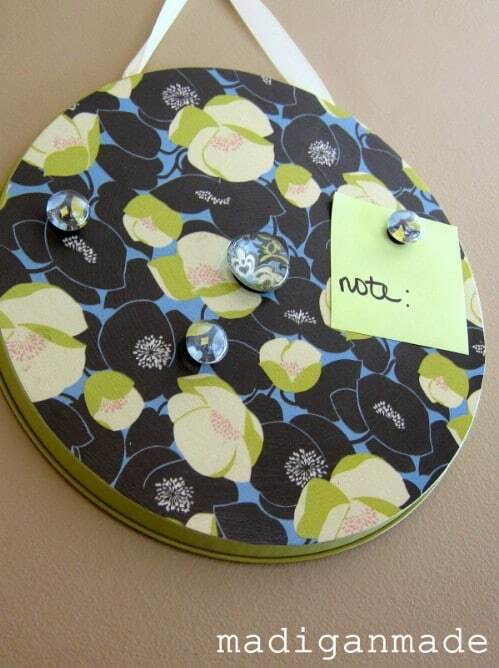 It is very versatile, takes little time and money to make and is great for organizing the home. If you are looking for an effective and unique way to get your earrings organized, you can use a cheese grater. The holes in the grater are perfect for inserting earrings and you can paint it whatever color you want to match your current décor. This is a whimsical yet functional use for an ordinary cheese grater. A hanging shoe organizer is a great choice to keep your herb garden organized. If you have little space for a traditional herb garden, this is the perfect way to grow your own herbs without worries of land and space. Just fill in the compartments with potting soil and your herbs and label them. You could even use this indoors during the winter so you can have fresh herbs all year long. 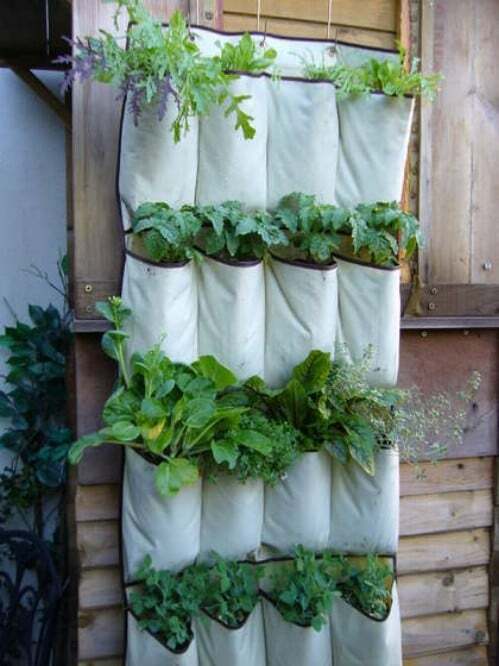 Via: Curbly – How to turn a hanging pocket shoe organizer into a vertical garden. A simple slacks hanger will work to keep your flip flops organized. Just remove the cardboard rod at the bottom of the hanger and then bend the ends up just a bit so that your shoes will stay on while you hang them. If you don’t really have room on your closet rod, just add another tension rod lower to the floor to hang them. 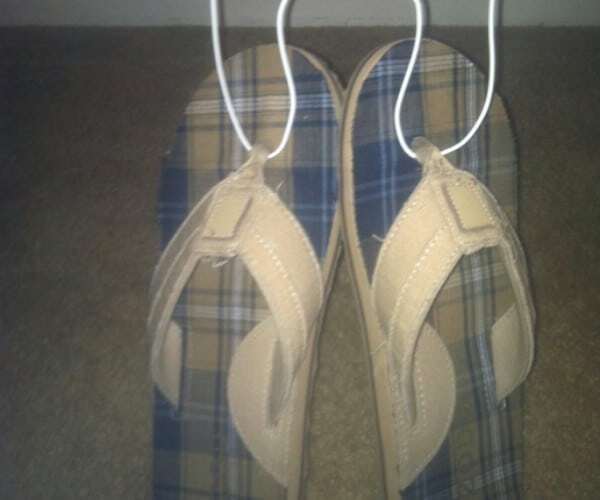 Via: Snapguide – How to Organize Flip Flops. Cheap and Easy! 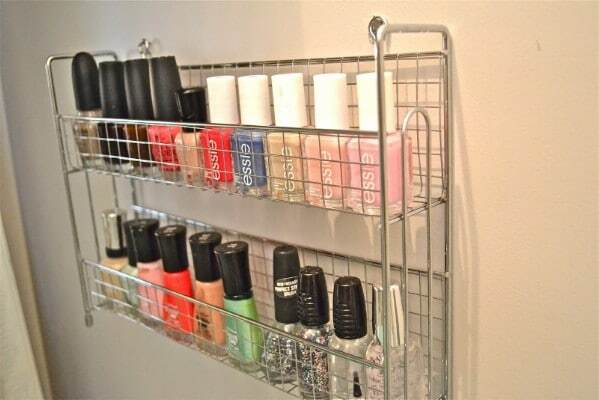 You can pick up a really cheap metal spice rack at any Dollar Store and these are perfect for organizing your nail polish. If you have too many for one rack, just hang them side by side to make it look like a huge organization center. You can even stand them on a countertop if you don’t have enough wall space. 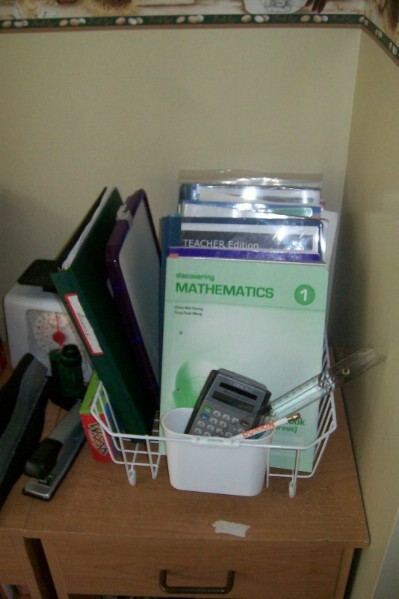 Organizing your homeschool supplies is easy. You need a dish rack and that’s about it. The rack will hold books and folders neatly and the small silverware compartment is perfect for keeping pens and pencils organized. 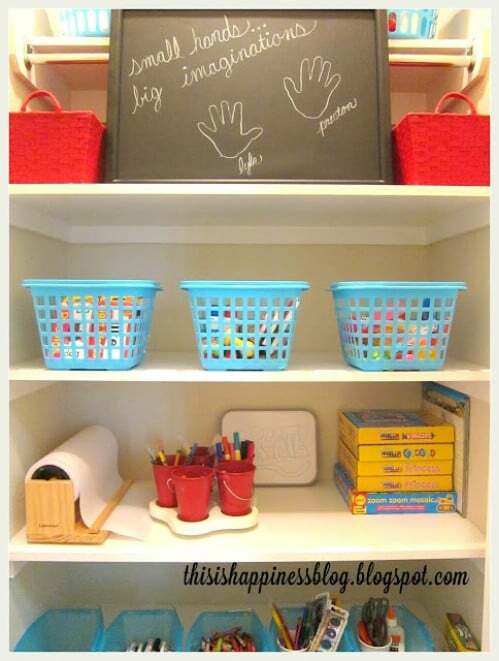 Whether you homeschool or not, this is a great way to keep school supplies organized. If you have space underneath the bed, this is the perfect place to keep canvas baskets. You can place loads of things in the baskets like shoes, seasonal clothing and other items and then just pull them out as you need them. 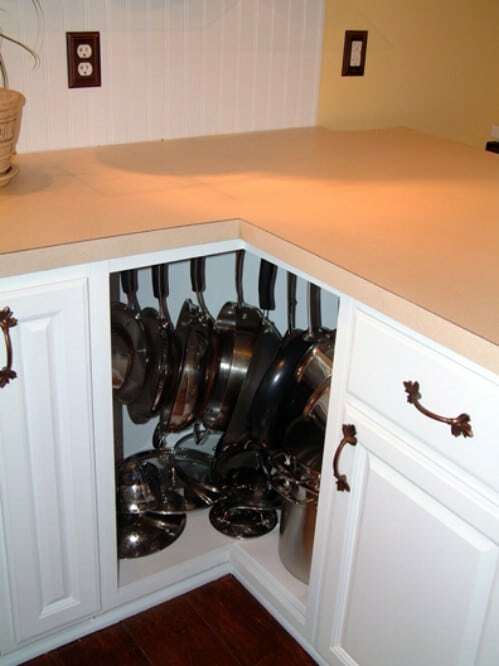 If you need to keep the lids to your pots and pans organized and you have little cabinet space available, you can just attach a curtain rod to the inside of your cabinet door. 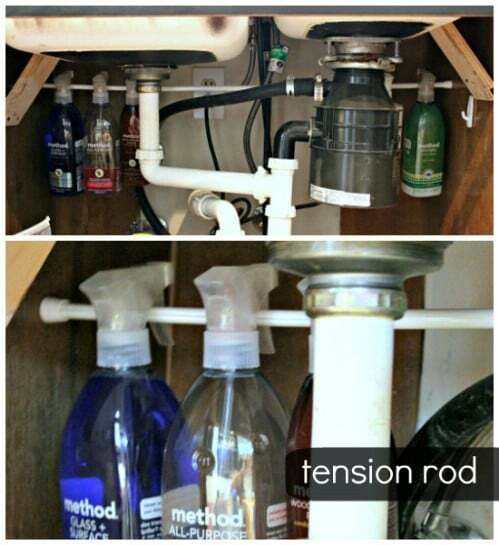 In fact, you can do two or three rods depending on the side of your cabinet. Pan lids will fit in and be held in place by their handles. A great way to keep pots and pans neat and tidy is to use command hooks and just hang them up. You can hang them inside cabinets by just applying the hooks to the inside of your cabinet walls. 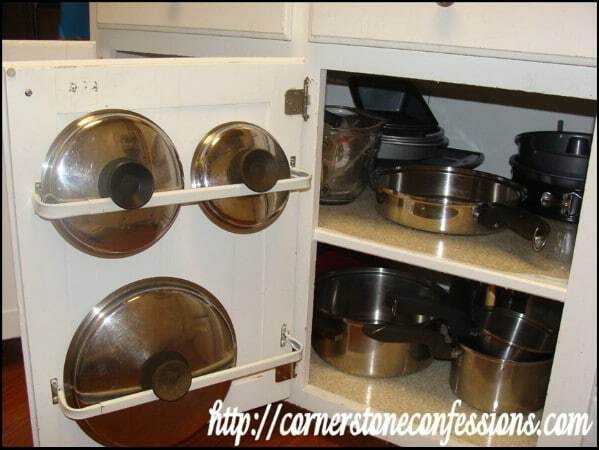 This is great for taller cabinets and lets you keep pans where you can find them easily. Keeping cables and cords off the floor makes the whole room look a bit more organized. 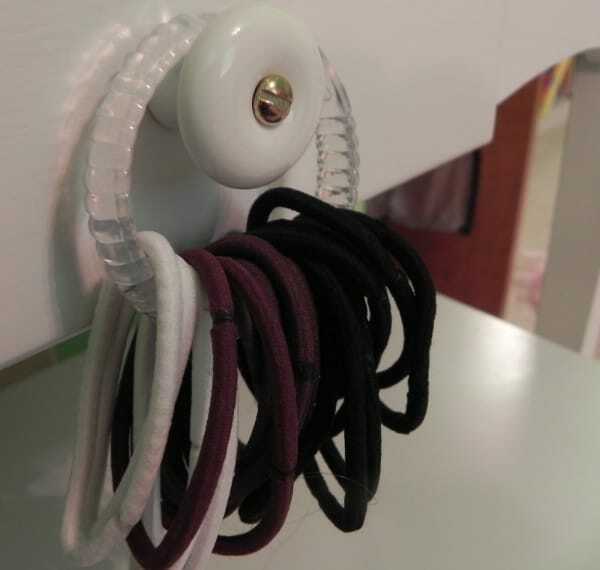 If you have a few cables that you don’t use all the time but you want to keep them handy, just use a push pin to hold a binder clip to the inside of your closet door or just anywhere you want to keep them. The clip will hold your cords and cables and keep them from getting lost. Via: Seesaw – HOW TO: cheap and easy way to organize small cables for mobile devices and games. A simple pencil box or craft box will work to keep arts and crafts supplies during long trips. You can fit crayons and other items into the plastic box and even throw in a few papers for drawing. 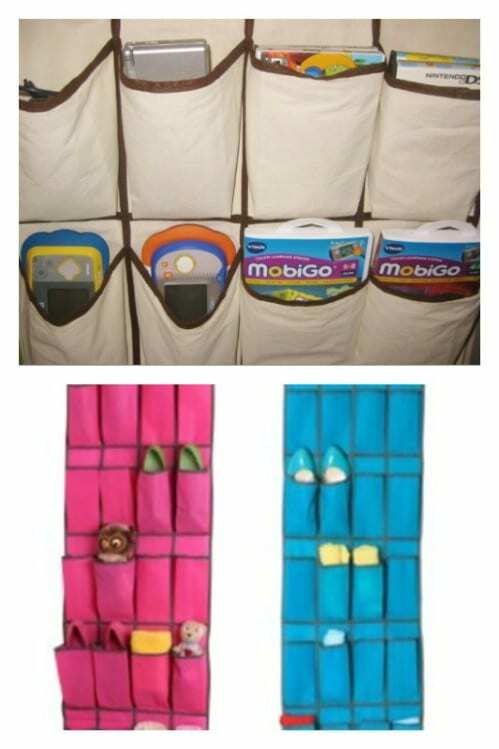 This ensures that your child can easily get to their things when they want and keeps them tidy and off the car floor. These are great ideas! I will use a lot of them! Good ideas however Blondeesdiary is not an accessible blog. It is only open for invited readers and there is no contact info to even access the blog or get permission. Maybe she shut it down? I thought that was good, too. I used soap dishes to make small first aid like kits for my kids back packs. Put stuff like bandaids, chap stick, hand sanitizer, emergency numbers, feminine needs etc….worked great and came in handy numerous times. Where did you get the garment bags for the sweaters? these look like 2 gallon storage bags. Kind of hard to find in stores. Probably can easily find online. I use them for a lot of things. Especially traveling. I can easily place an entire day’s attire in one bag. Love them! I love all these wonderful ideas. As an artist, I am always looking for great ways to organize art supplies. I am also a gallery manager and loved the idea of using the pail, cloth, and exterior pockets for art supplies, to be used for the “little ones” to use when visiting the gallery. However, I could not find the directions. You can purchase the tool pouch shown in the picture at Home Depot or Lowes. It’s in the tool dept. they also sell the buckets in the paint dept. I have one for earring organization… just get a piece of felt (about the size of a sheet of paper), safety-pin it to a hanger, and you can put your earrings in whatever order you want! TIP: when attaching to a hanger, fold over only an inch or less to get more space for your earrings! I use this, and it’s great to have in your closet, taking up next to no space at all, easy to grab, easy to tell which earrings are there, & you can place your earrings HOWER YOU WANT and not just in a straight line. So hang your dangles on the bottom, and put your studs into flowers organized by colour, or make the coolest earring chevron anyone has ever seen! Sorry that I don’t have any pictures, but, hopefully, the description is enough for an 85¢ hack! I use the dollar store shoe bags to set up my bill payments for each month. Jan thru December. Just label each pouch after s month. I also use it for keeping coupons organized for each month to use before they expire. One hangs in the kitchen the other in my home office. 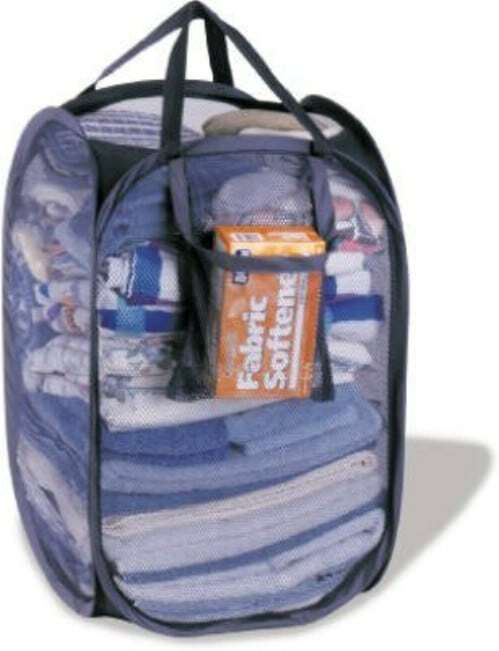 3. totes and mesh laundry baskets. GREAT. common sense is NOT so common these days. I wouldn’t quite go that far, but it certainly did get repetitive after a few pages. Would have been more useful if it had undergone a little organisation itself – keeping like items together would have made for a far less tedious plough-through. waist of time????? How about waste! University student? Waw sam1 got preetee ofendid-bi a speleeng eror! ON THE COMENTS SEKTYON!! — OF AN «O R G A N A I Z E E N G – H A X» POST ONLAIN!!! Ultimately, it’s about Priorities. It’s a Call. It’s a Duty. But foremost & above all, it’s about knowing what MATTERS! If you do not have something good to say, don’t say anything at all people!! P.S. I love the great ideas! The ideas are great! But the ad on each picture is a bit much!!! Please remove them!! Too frustrating to hit the x to remove the ad to see the full picture just to have it not remove the ad but goes straight to the ads advertising page! I keep finding an arrow which says, “page 1 of 5” I get to see the second page , but never see an arrow for the remaining pages. Does anyone know? These ideas really get me going. i use a few of these myself..definitely the shoe organizers in my small apt with two boys…not only for shoes.. medicines/vitamins, first aid supplies,toiletries.. right at my fingertips hanging right inside and out of my hall closets, and up away from my youngest..